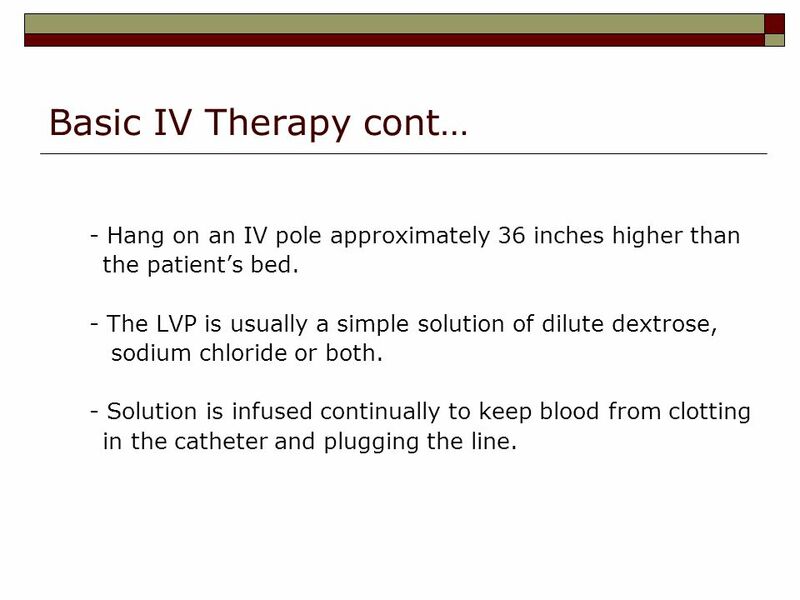 4 Basic IV Therapy cont… - Hang on an IV pole approximately 36 inches higher than the patient’s bed. - The LVP is usually a simple solution of dilute dextrose, sodium chloride or both. - Solution is infused continually to keep blood from clotting in the catheter and plugging the line. 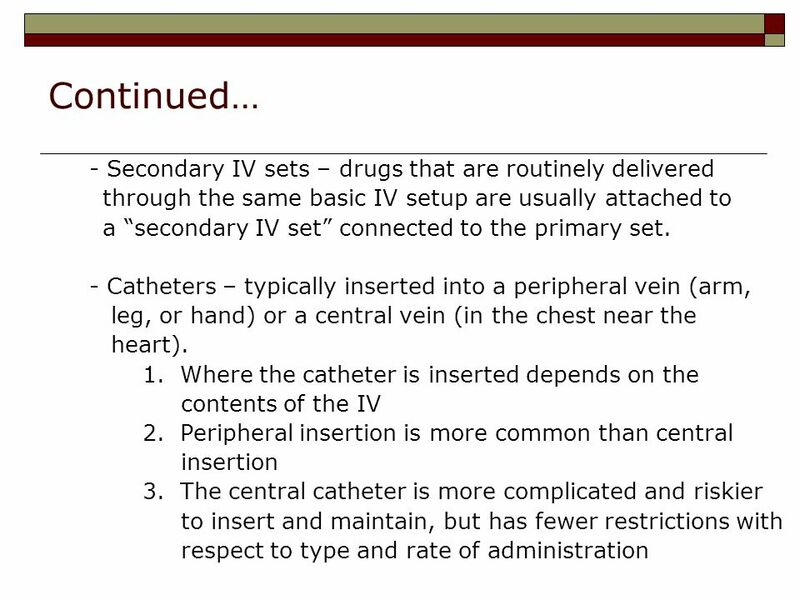 5 Basic IV Therapy cont… - Primary IV set – attaches to the LVP. Most IV sets that flow by the force of gravity have several common features: 1. Drip chambers are typically classified as macrodrip or minidrip based on the size of the drop that is formed in the drip chamber. a. Macrodrip – deliver 10 to 20 drops/mL b. Minidrop or Microdrip – deliver 60 drops/mL 2. 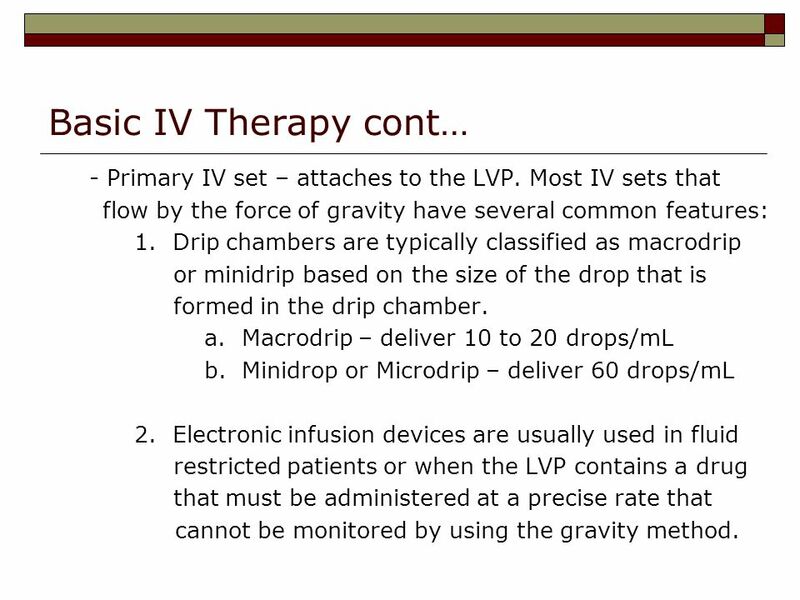 Electronic infusion devices are usually used in fluid restricted patients or when the LVP contains a drug that must be administered at a precise rate that cannot be monitored by using the gravity method. 8 Continued… 6. 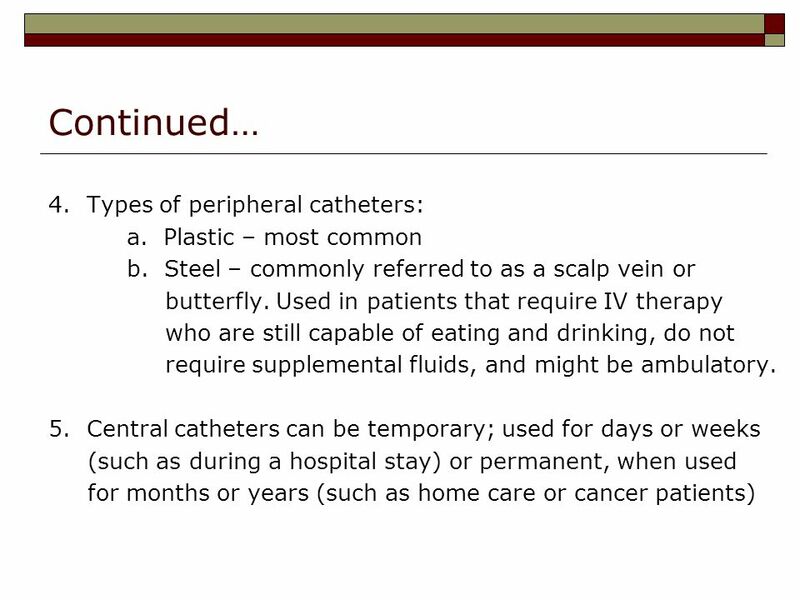 The central catheter gives direct access into a vein that that has a high flow of blood. 7. 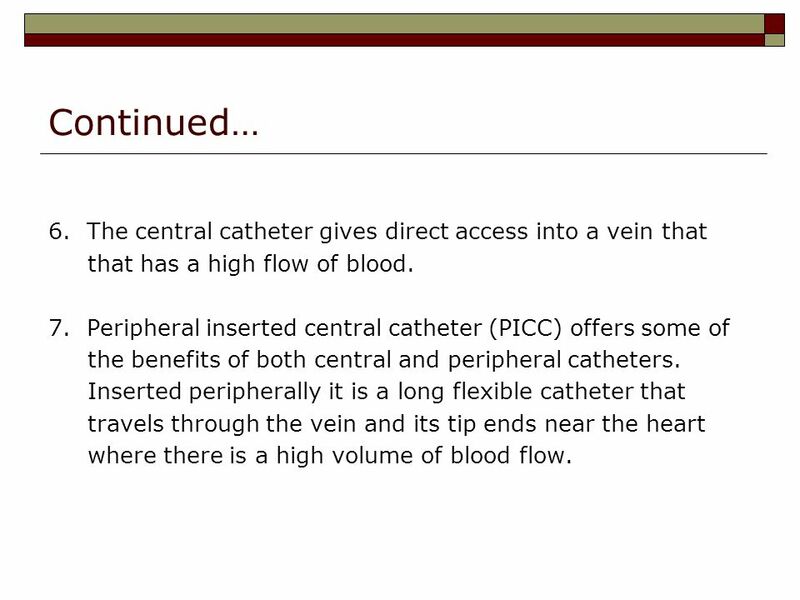 Peripheral inserted central catheter (PICC) offers some of the benefits of both central and peripheral catheters. Inserted peripherally it is a long flexible catheter that travels through the vein and its tip ends near the heart where there is a high volume of blood flow. Infection – results if a product contaminated with bacteria is infused into a patient. - human touch contamination continues to be the most common source of IV related contamination. 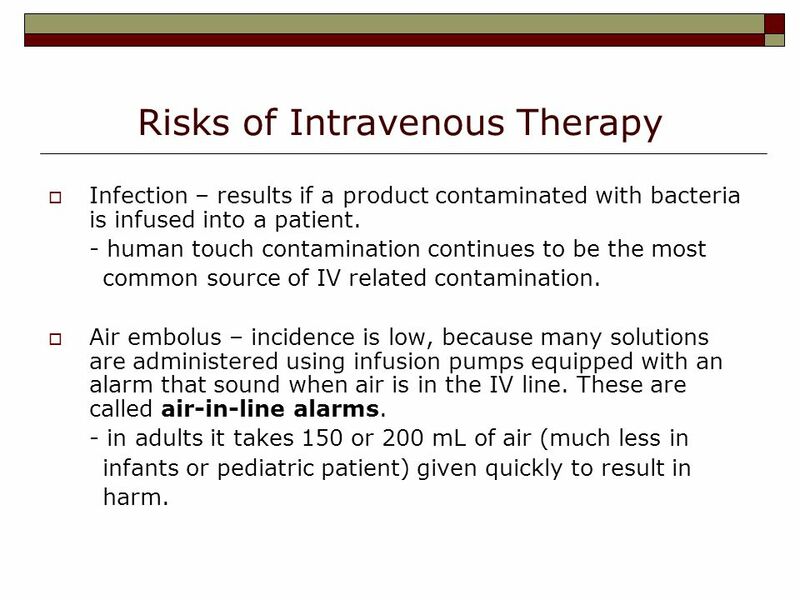 Air embolus – incidence is low, because many solutions are administered using infusion pumps equipped with an alarm that sound when air is in the IV line. These are called air-in-line alarms. 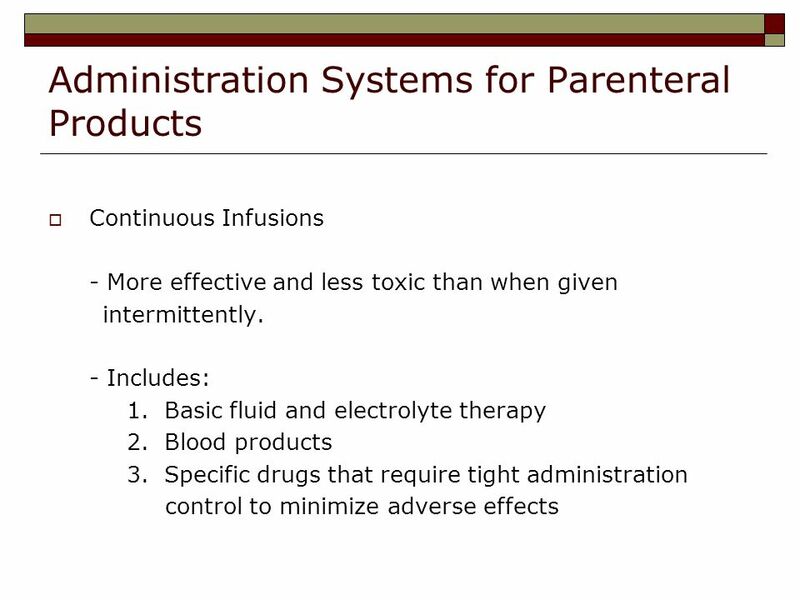 - in adults it takes 150 or 200 mL of air (much less in infants or pediatric patient) given quickly to result in harm. 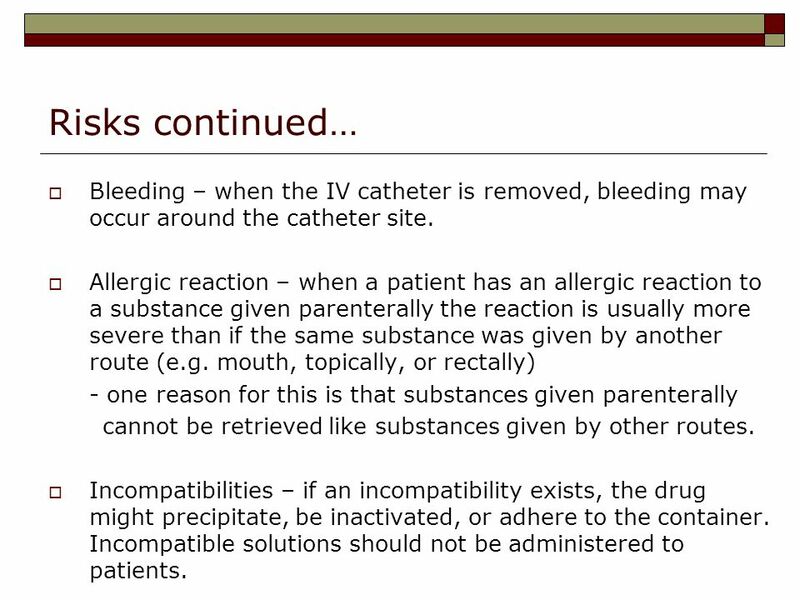 10 Risks continued… Bleeding – when the IV catheter is removed, bleeding may occur around the catheter site. Allergic reaction – when a patient has an allergic reaction to a substance given parenterally the reaction is usually more severe than if the same substance was given by another route (e.g. mouth, topically, or rectally) - one reason for this is that substances given parenterally cannot be retrieved like substances given by other routes. Incompatibilities – if an incompatibility exists, the drug might precipitate, be inactivated, or adhere to the container. Incompatible solutions should not be administered to patients. 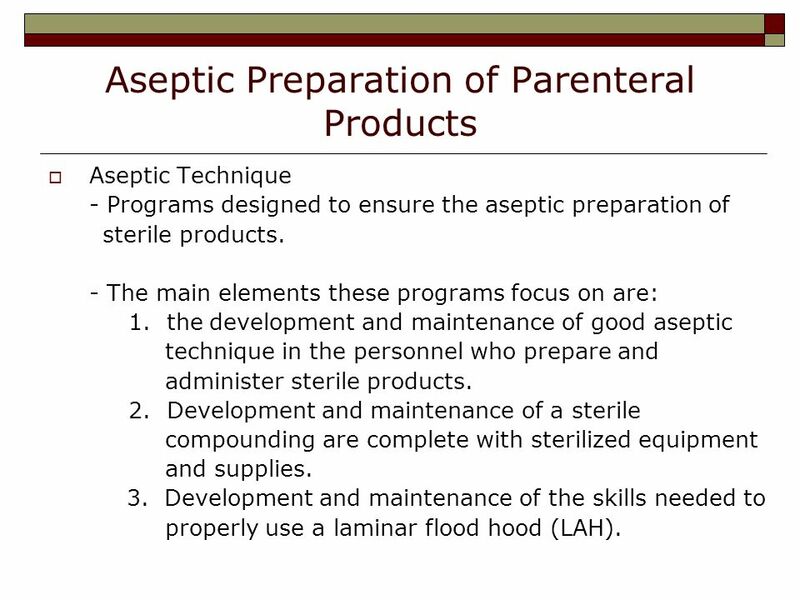 Aseptic Technique - Programs designed to ensure the aseptic preparation of sterile products. - The main elements these programs focus on are: 1. the development and maintenance of good aseptic technique in the personnel who prepare and administer sterile products. 2. Development and maintenance of a sterile compounding are complete with sterilized equipment and supplies. 3. Development and maintenance of the skills needed to properly use a laminar flood hood (LAH). Aseptic technique is a means of manipulating sterile products without contaminating them. 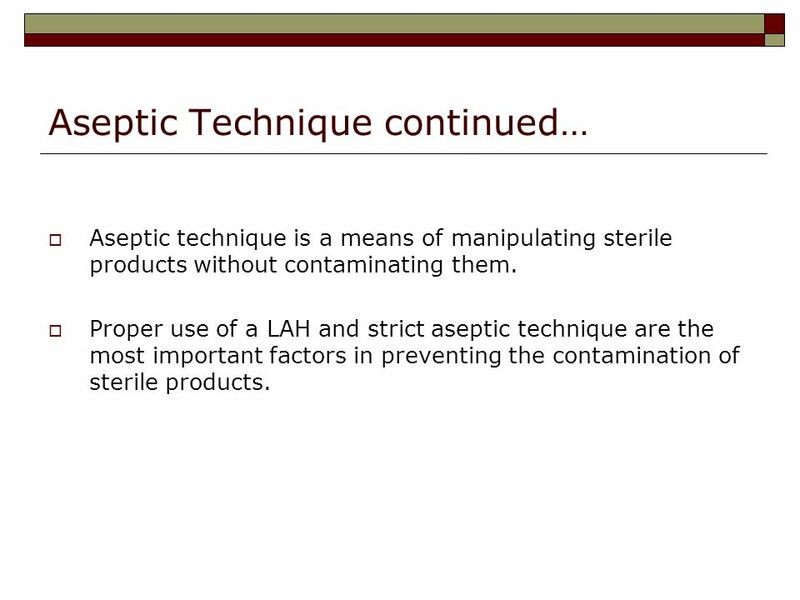 Proper use of a LAH and strict aseptic technique are the most important factors in preventing the contamination of sterile products. Sterile parenteral solutions must be free of living microorganisms and relatively free of particles and pyrogens. 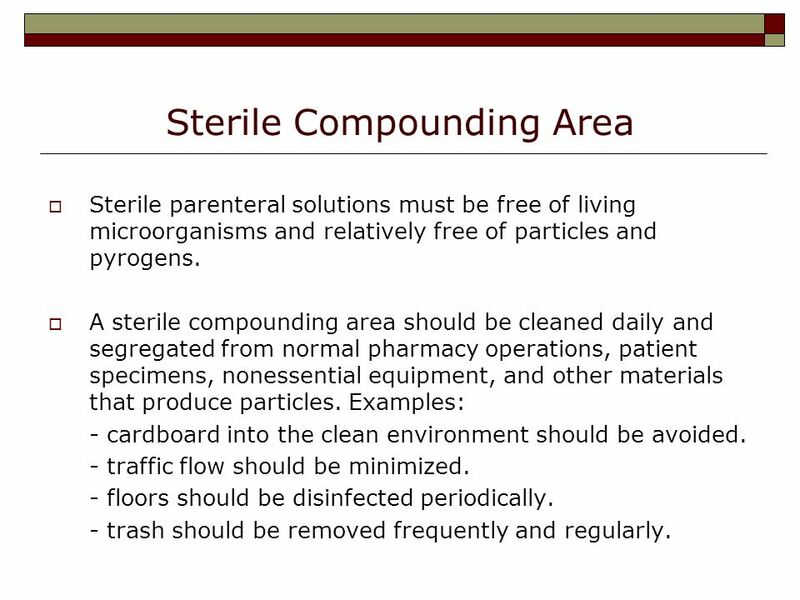 A sterile compounding area should be cleaned daily and segregated from normal pharmacy operations, patient specimens, nonessential equipment, and other materials that produce particles. Examples: - cardboard into the clean environment should be avoided. - traffic flow should be minimized. - floors should be disinfected periodically. - trash should be removed frequently and regularly. 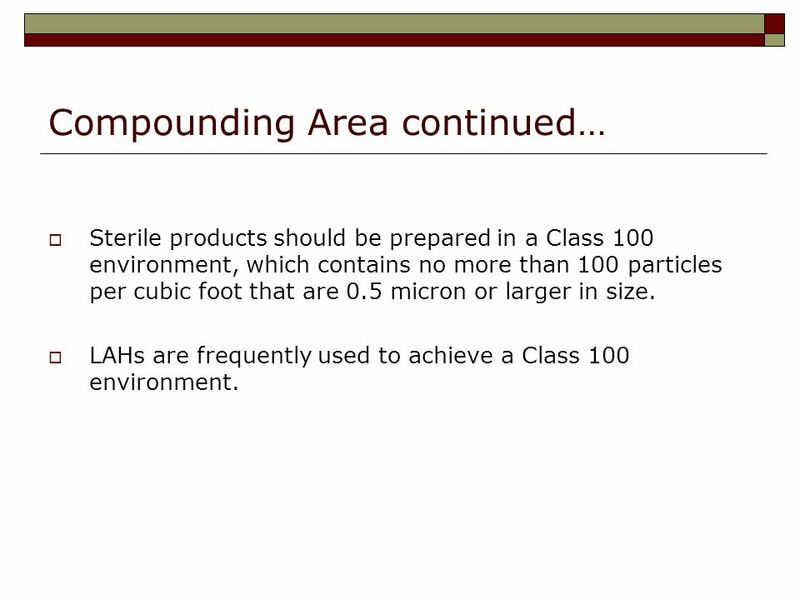 Sterile products should be prepared in a Class 100 environment, which contains no more than 100 particles per cubic foot that are 0.5 micron or larger in size. LAHs are frequently used to achieve a Class 100 environment. 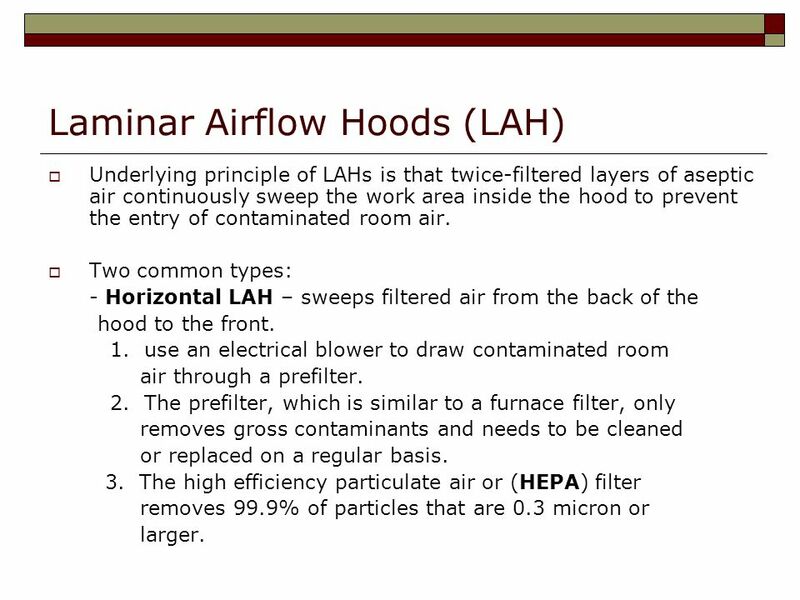 Underlying principle of LAHs is that twice-filtered layers of aseptic air continuously sweep the work area inside the hood to prevent the entry of contaminated room air. Two common types: - Horizontal LAH – sweeps filtered air from the back of the hood to the front. 1. use an electrical blower to draw contaminated room air through a prefilter. 2. The prefilter, which is similar to a furnace filter, only removes gross contaminants and needs to be cleaned or replaced on a regular basis. 3. The high efficiency particulate air or (HEPA) filter removes 99.9% of particles that are 0.3 micron or larger. Vertical LAH – HEPA filtered air emerges from the top and passes downward through the work area. - used for antineoplastic (anticancer) drugs. - the risk of exposure to airborne drug particulates is minimized. 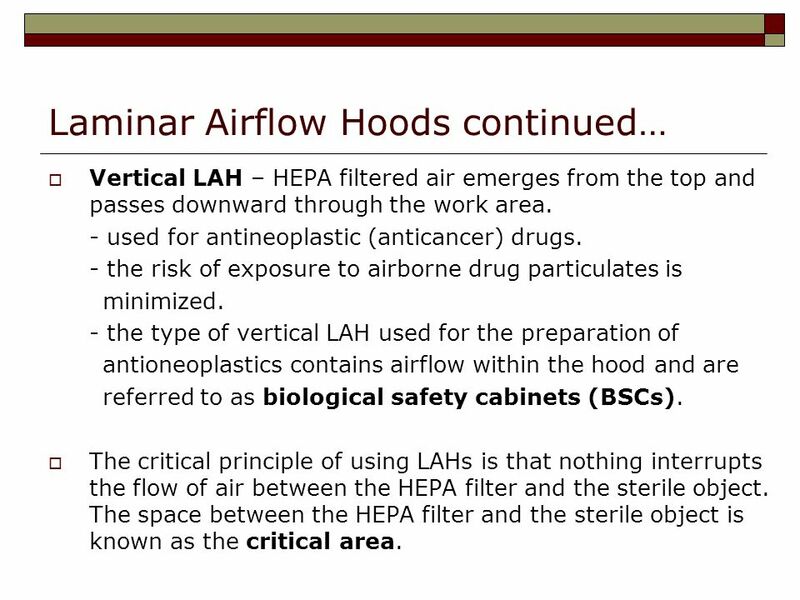 - the type of vertical LAH used for the preparation of antioneoplastics contains airflow within the hood and are referred to as biological safety cabinets (BSCs). The critical principle of using LAHs is that nothing interrupts the flow of air between the HEPA filter and the sterile object. The space between the HEPA filter and the sterile object is known as the critical area. 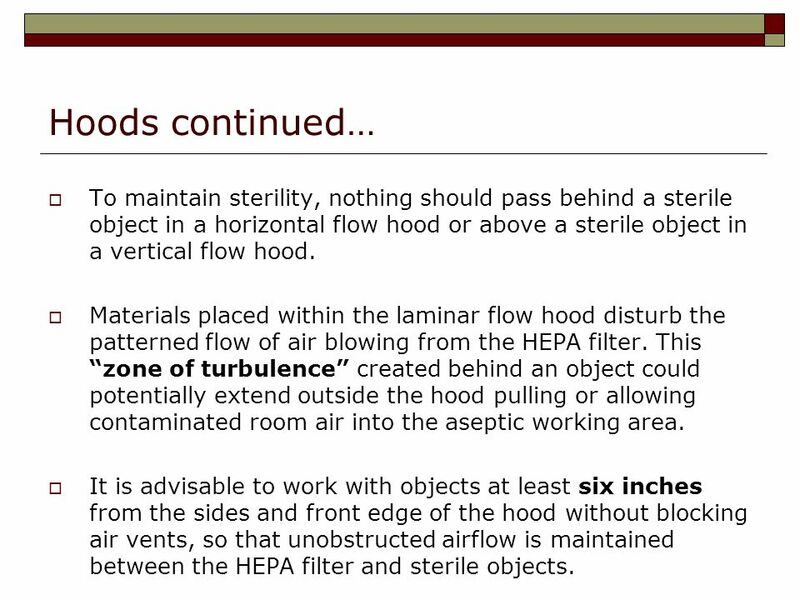 19 Hoods continued… To maintain sterility, nothing should pass behind a sterile object in a horizontal flow hood or above a sterile object in a vertical flow hood. Materials placed within the laminar flow hood disturb the patterned flow of air blowing from the HEPA filter. This “zone of turbulence” created behind an object could potentially extend outside the hood pulling or allowing contaminated room air into the aseptic working area. It is advisable to work with objects at least six inches from the sides and front edge of the hood without blocking air vents, so that unobstructed airflow is maintained between the HEPA filter and sterile objects. 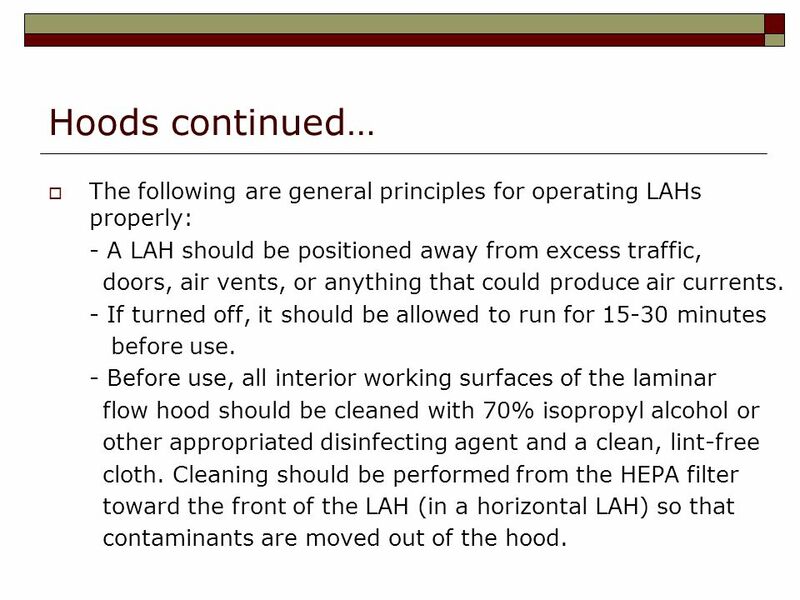 20 Hoods continued… The following are general principles for operating LAHs properly: - A LAH should be positioned away from excess traffic, doors, air vents, or anything that could produce air currents. - If turned off, it should be allowed to run for minutes before use. - Before use, all interior working surfaces of the laminar flow hood should be cleaned with 70% isopropyl alcohol or other appropriated disinfecting agent and a clean, lint-free cloth. Cleaning should be performed from the HEPA filter toward the front of the LAH (in a horizontal LAH) so that contaminants are moved out of the hood. Nothing should be permitted to come in contact with the HEPA filter. 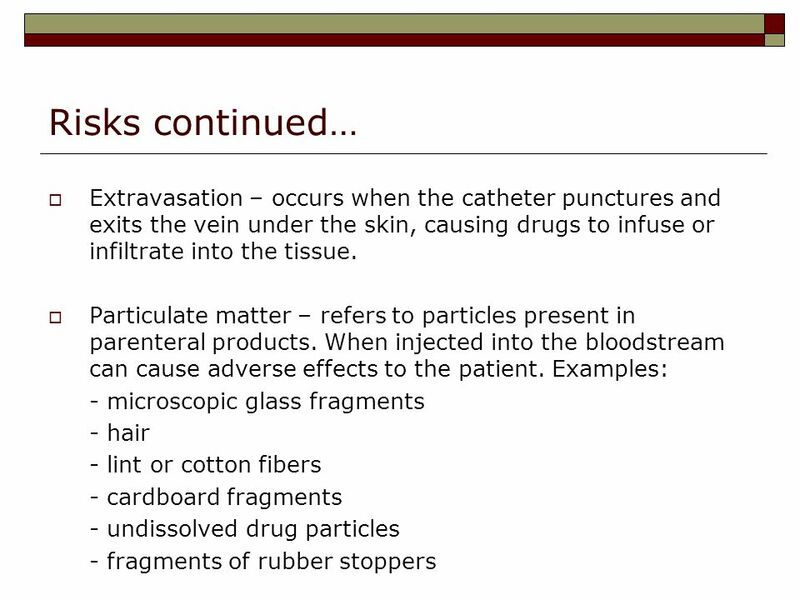 This includes cleaning solution, aspirate from syringes, or glass from ampules. Ampules should not be opened directly toward the filter. Do not put paper, pens, labels, or trays into the hood. 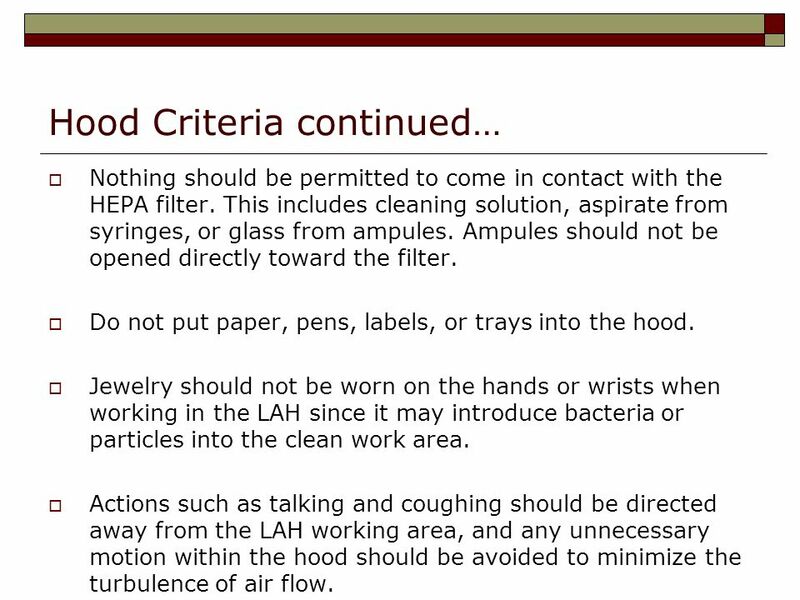 Jewelry should not be worn on the hands or wrists when working in the LAH since it may introduce bacteria or particles into the clean work area. Actions such as talking and coughing should be directed away from the LAH working area, and any unnecessary motion within the hood should be avoided to minimize the turbulence of air flow. Smoking, eating or drinking are prohibited in the aseptic environment. 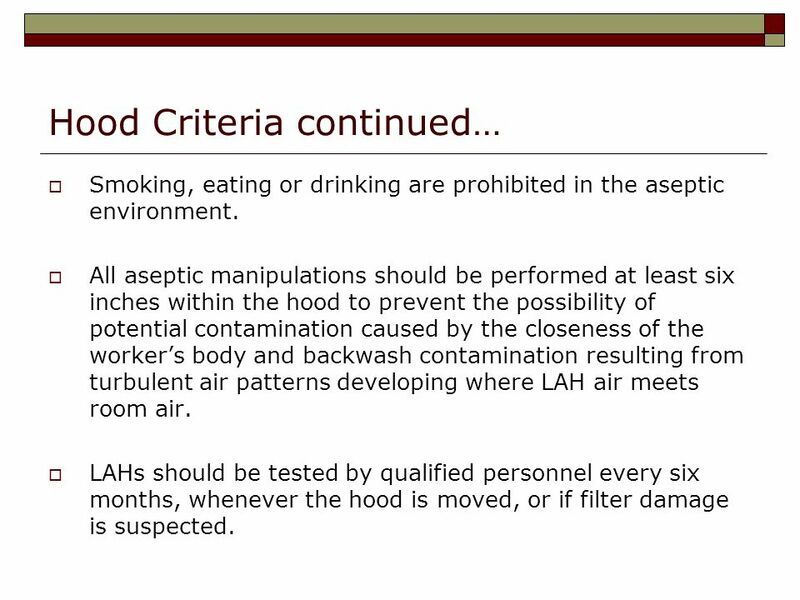 All aseptic manipulations should be performed at least six inches within the hood to prevent the possibility of potential contamination caused by the closeness of the worker’s body and backwash contamination resulting from turbulent air patterns developing where LAH air meets room air. LAHs should be tested by qualified personnel every six months, whenever the hood is moved, or if filter damage is suspected. 23 Personal Attire The first component of good aseptic technique is proper personal attire. 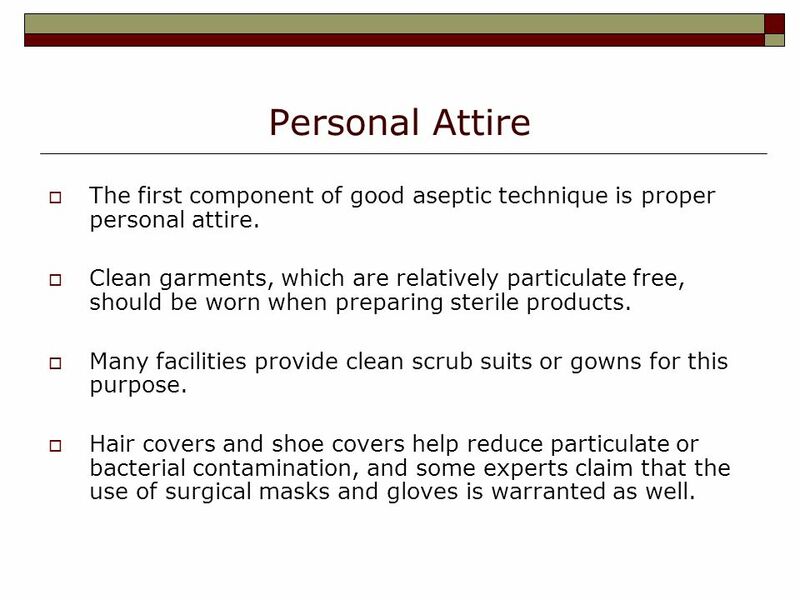 Clean garments, which are relatively particulate free, should be worn when preparing sterile products. Many facilities provide clean scrub suits or gowns for this purpose. 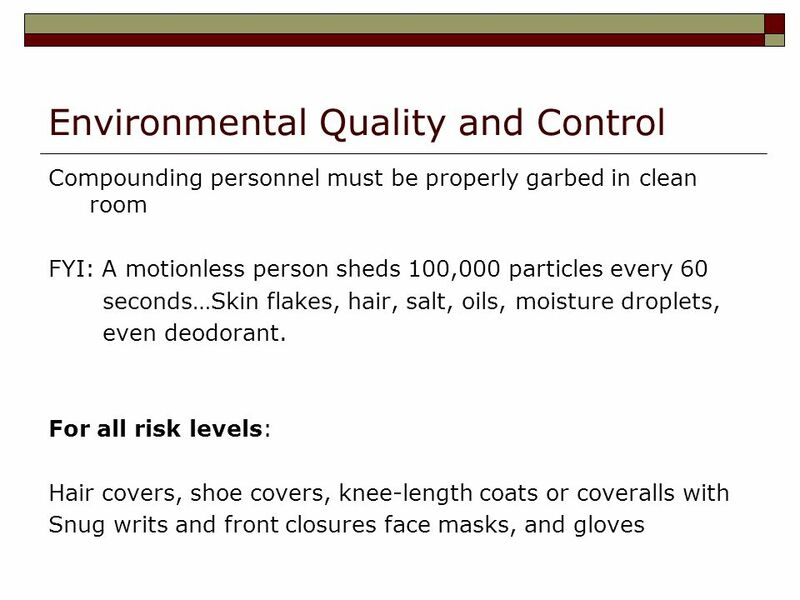 Hair covers and shoe covers help reduce particulate or bacterial contamination, and some experts claim that the use of surgical masks and gloves is warranted as well. 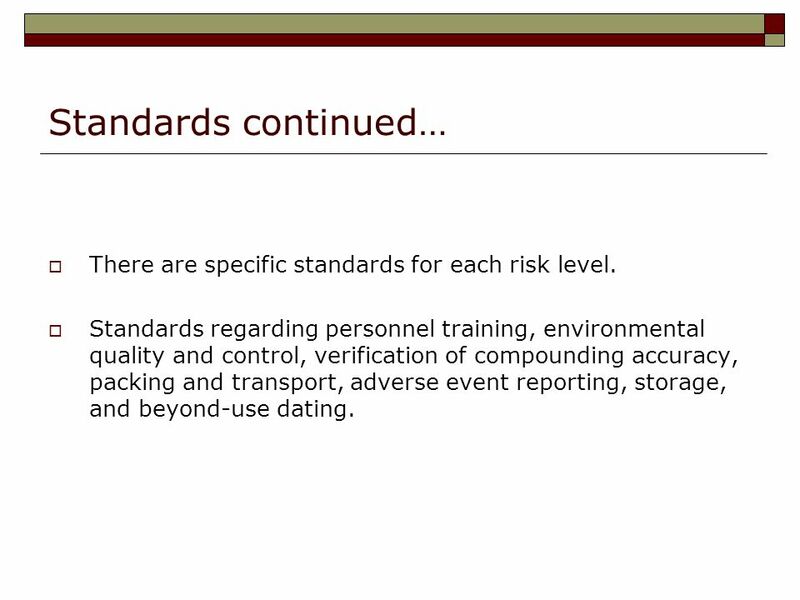 25 Standards continued… There are specific standards for each risk level. Standards regarding personnel training, environmental quality and control, verification of compounding accuracy, packing and transport, adverse event reporting, storage, and beyond-use dating. Work bench area: where compounding is completed Buffer area = clean room: area immediately surrounding the work bench. Should not contain any drains or sinks. 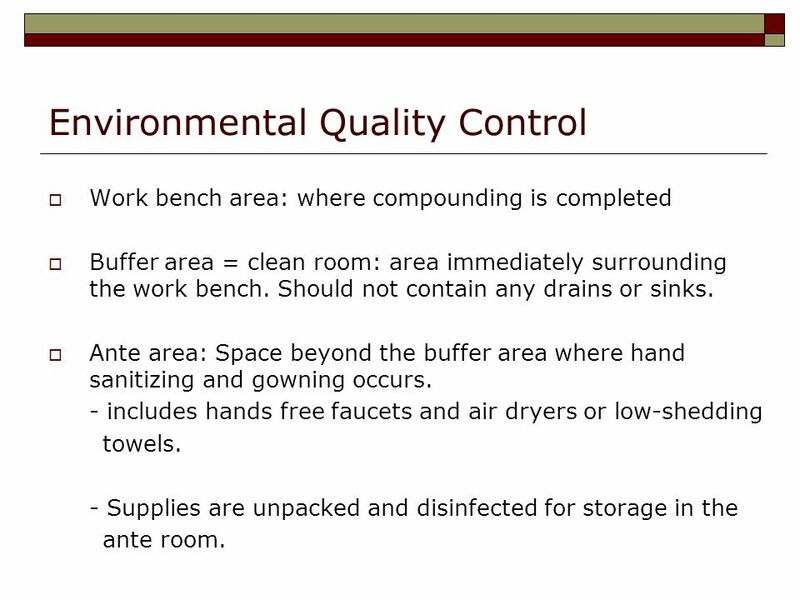 Ante area: Space beyond the buffer area where hand sanitizing and gowning occurs. - includes hands free faucets and air dryers or low-shedding towels. - Supplies are unpacked and disinfected for storage in the ante room. General Requirements: - Must limit tasks performed in the buffer area to those directly related to compounding. 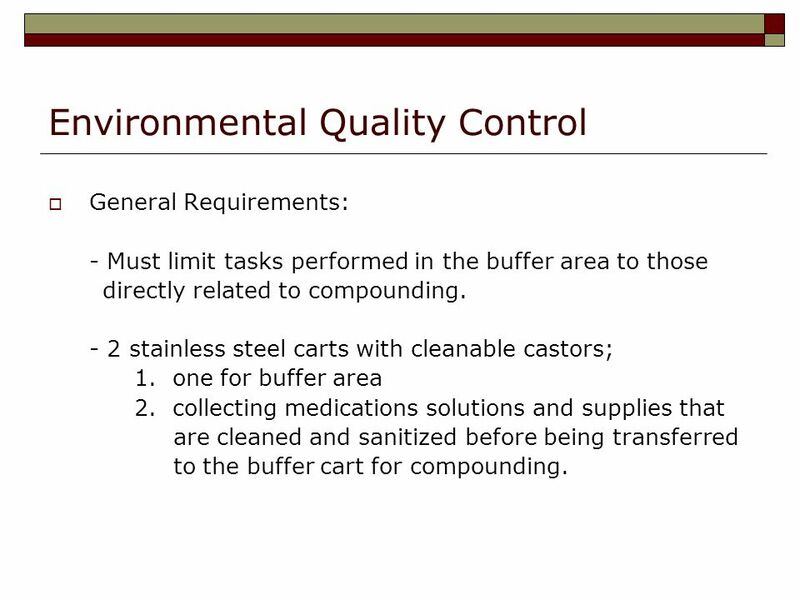 - 2 stainless steel carts with cleanable castors; 1. one for buffer area 2. collecting medications solutions and supplies that are cleaned and sanitized before being transferred to the buffer cart for compounding. 33 Handwashing Touching sterile products while compounding is the most common source of contamination of pharmacy prepared sterile products. Scrub your hands, nails, wrists, and forearms thoroughly for at least 30 seconds with a brush, warm water, and appropriate bactericidal soap before performing aseptic manipulations. Wash your hands frequently and every time you re-enter the sterile compounding area. Workers who have open sores on their hands or have an upper respiratory tract infection should inform their supervisor and/or consult the institutions quality assurance procedures. Wear sterile gloves and mask is needed. 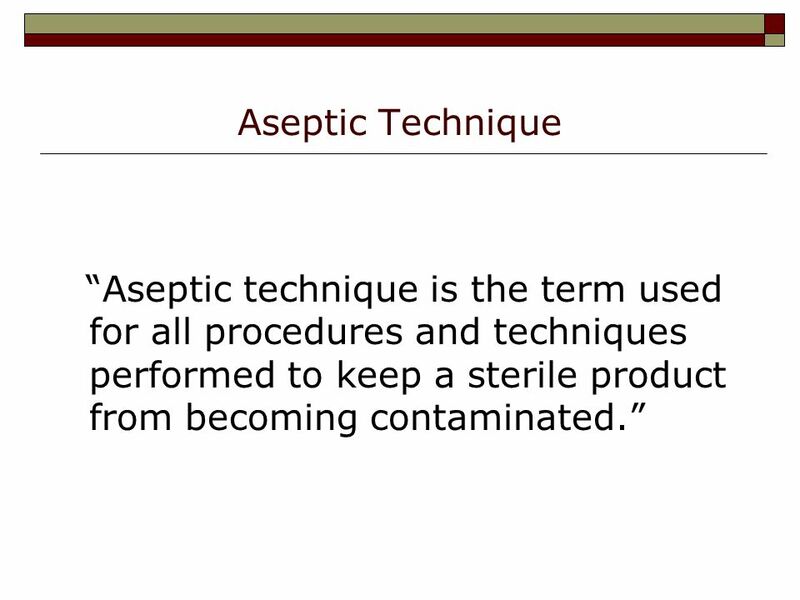 Another important factor in aseptic preparation of sterile products is the correct use of appropriate sterile equipment and supplies, including syringes and needles. Syringes: - made of either glass or plastic - most drugs are more stable in glass, so glass syringes are most often used when medication is to be stored in the syringe for an extended period of time. - Composed of a barrel and plunger. 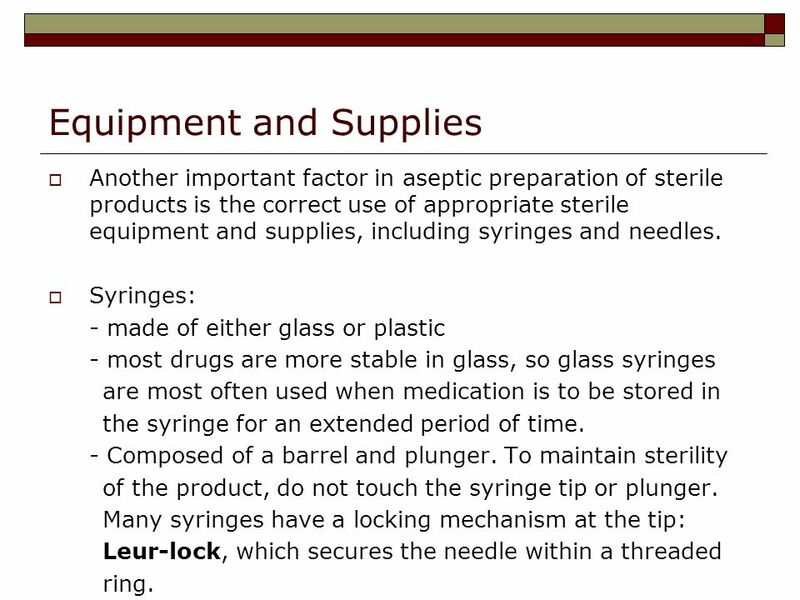 To maintain sterility of the product, do not touch the syringe tip or plunger. Many syringes have a locking mechanism at the tip: Leur-lock, which secures the needle within a threaded ring. 35 Syringes continued… Available in numerous sizes ranging from 0.5 to 60 mL. Usually the larger the syringe capacity, the larger the interval between calibration lines. Ideally, the volume of solution should only take up ½ to 2/3 of the syringe capacity. This avoids inadvertent touch contamination caused when the syringe plunger is pulled all the way back. 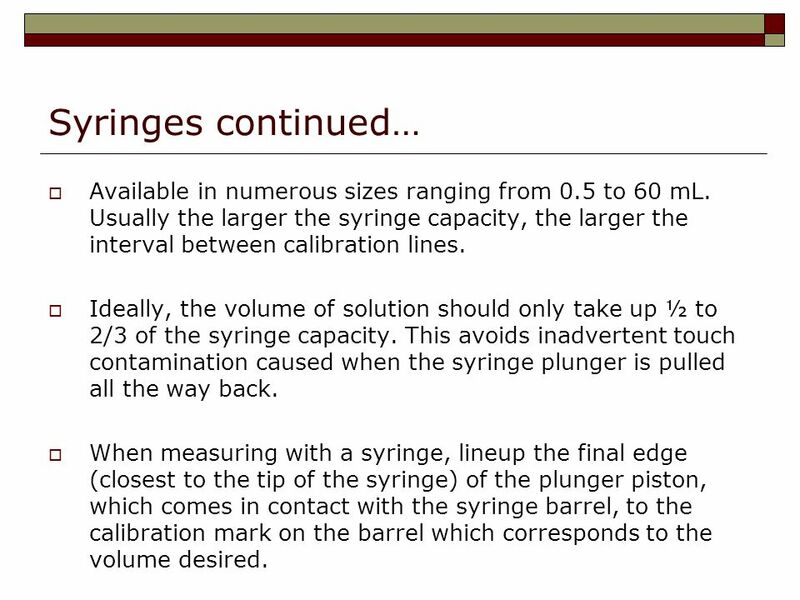 When measuring with a syringe, lineup the final edge (closest to the tip of the syringe) of the plunger piston, which comes in contact with the syringe barrel, to the calibration mark on the barrel which corresponds to the volume desired. 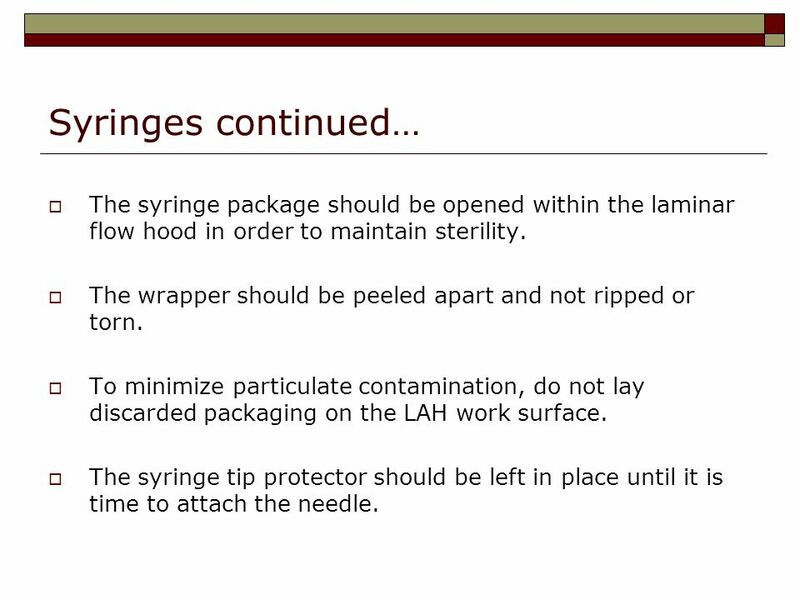 36 Syringes continued… The syringe package should be opened within the laminar flow hood in order to maintain sterility. The wrapper should be peeled apart and not ripped or torn. To minimize particulate contamination, do not lay discarded packaging on the LAH work surface. The syringe tip protector should be left in place until it is time to attach the needle. - Gauge: corresponds to the diameter of its bore, which is the diameter of the inside of the shaft. 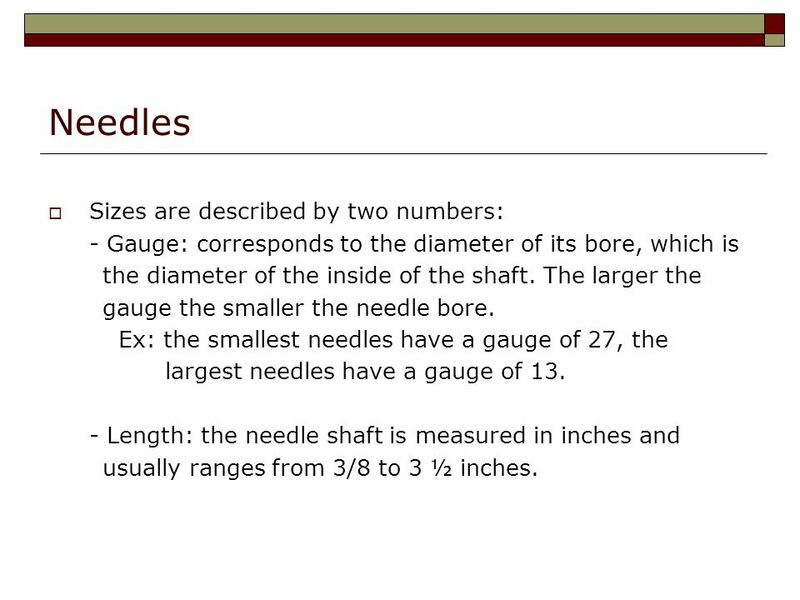 The larger the gauge the smaller the needle bore. Ex: the smallest needles have a gauge of 27, the largest needles have a gauge of 13. - Length: the needle shaft is measured in inches and usually ranges from 3/8 to 3 ½ inches. - Hub: attached the needle to the syringe and is often color-coded to correspond to a specific gauge. - Shaft: the tip of the needle shaft is slanted to form a point. The slant is called the bevel, the point is called the bevel tip. The opposite end of the slant is termed the bevel heel. No part of the needle itself should be touched. Needles should be manipulated by their over-wrap and protective covers only. The protective cover should be left in place until the needle and/or syringe are ready to be used. 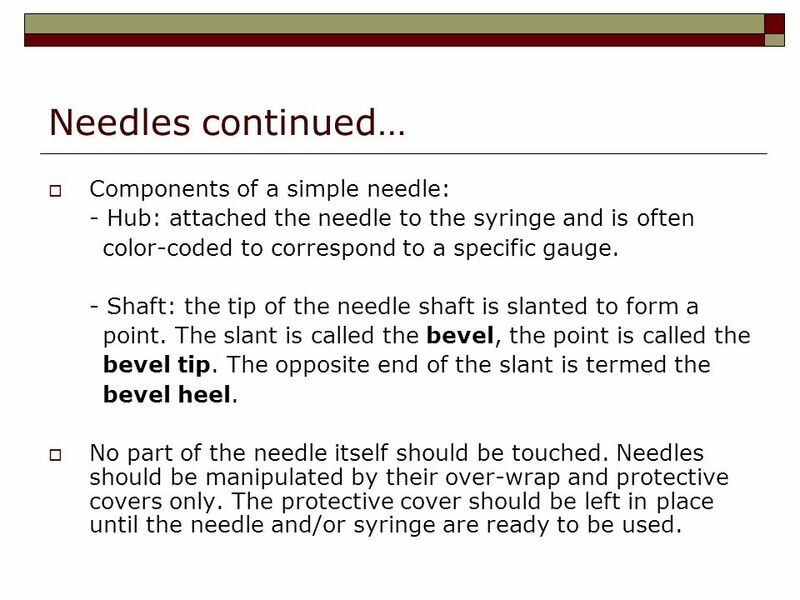 39 Needles continued… A needle shaft is usually metal and is lubricated with a sterile silicone coating. - For this reason, needles should never be swabbed with alcohol. Some needles have built in filters and are meant to be used with products requiring frequent such as drugs removed from a glass ampule. 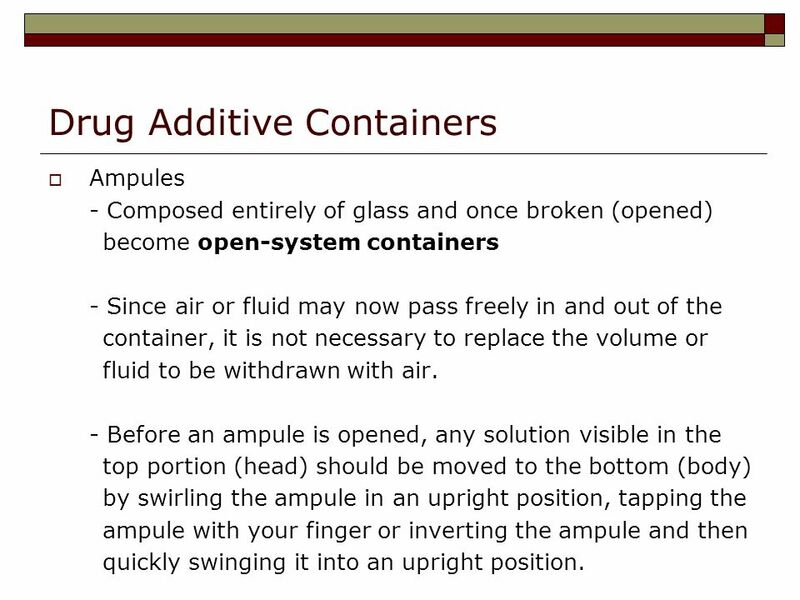 Ampules - Composed entirely of glass and once broken (opened) become open-system containers - Since air or fluid may now pass freely in and out of the container, it is not necessary to replace the volume or fluid to be withdrawn with air. - Before an ampule is opened, any solution visible in the top portion (head) should be moved to the bottom (body) by swirling the ampule in an upright position, tapping the ampule with your finger or inverting the ampule and then quickly swinging it into an upright position. 41 Ampule continued… To break an ampule properly, the head must be broken from the body of the ampule. 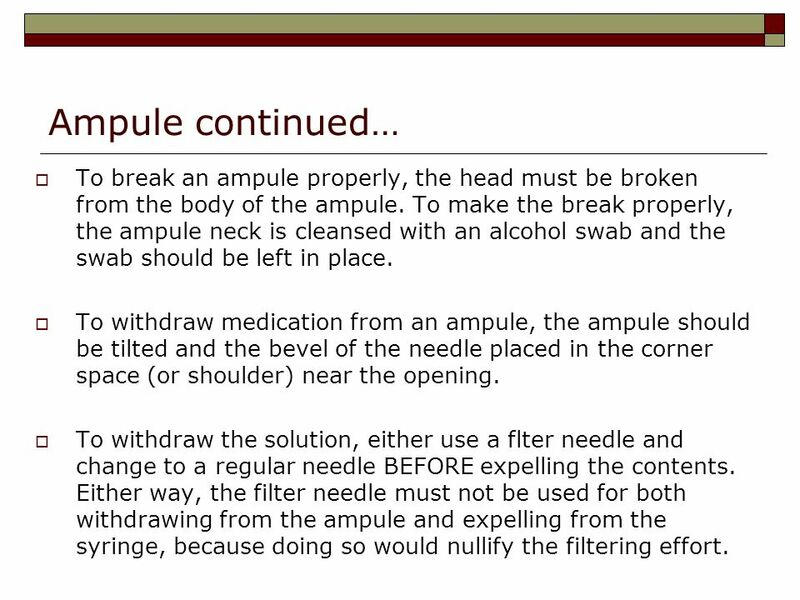 To make the break properly, the ampule neck is cleansed with an alcohol swab and the swab should be left in place. To withdraw medication from an ampule, the ampule should be tilted and the bevel of the needle placed in the corner space (or shoulder) near the opening. To withdraw the solution, either use a flter needle and change to a regular needle BEFORE expelling the contents. Either way, the filter needle must not be used for both withdrawing from the ampule and expelling from the syringe, because doing so would nullify the filtering effort. 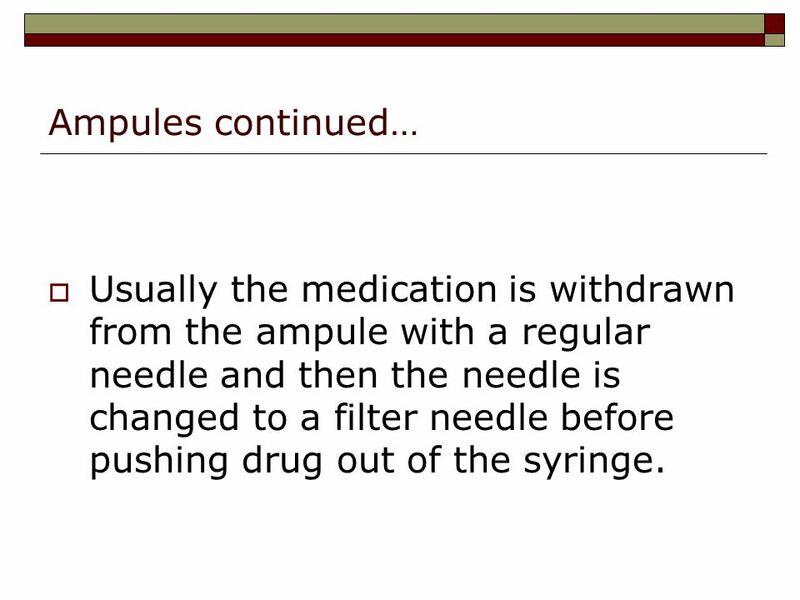 42 Ampules continued… Usually the medication is withdrawn from the ampule with a regular needle and then the needle is changed to a filter needle before pushing drug out of the syringe. 43 Vials Is a glass or plastic container with a rubber stopper secured to its top, usually by an aluminum cover. They are used to hold powders and liquids. The rubber stopper is usually protected by a flip-top cap or aluminum cover. 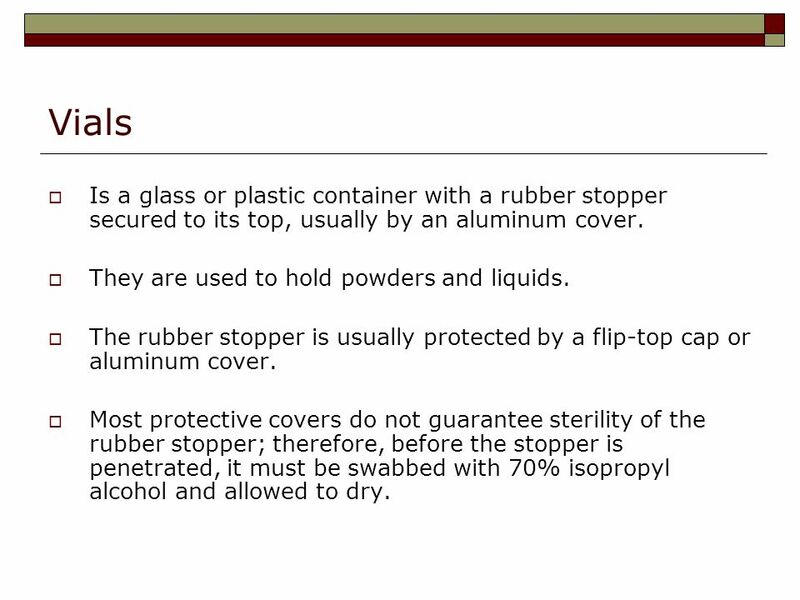 Most protective covers do not guarantee sterility of the rubber stopper; therefore, before the stopper is penetrated, it must be swabbed with 70% isopropyl alcohol and allowed to dry. - the alcohol acts as a disinfecting agent - the physical act of swabbing in one direction removes particles. When piercing vials with needles, avoid coring fragments out of the rubber stopper with the needle. - a core is carved out of the rubber stopper when the bevel tip and the bevel heel do not penetrate the stopper at the same point. 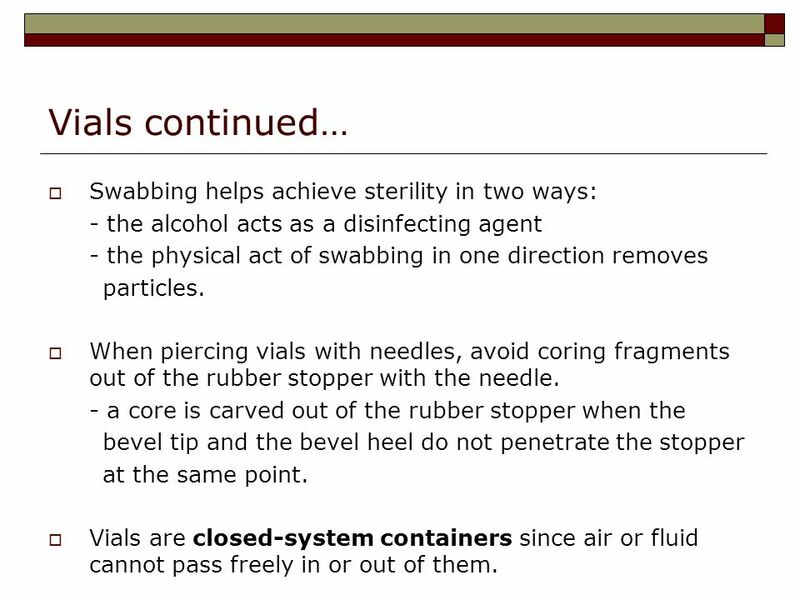 Vials are closed-system containers since air or fluid cannot pass freely in or out of them. 45 Vials continued… In most cases, air pressure inside the vial is similar to that of room air. 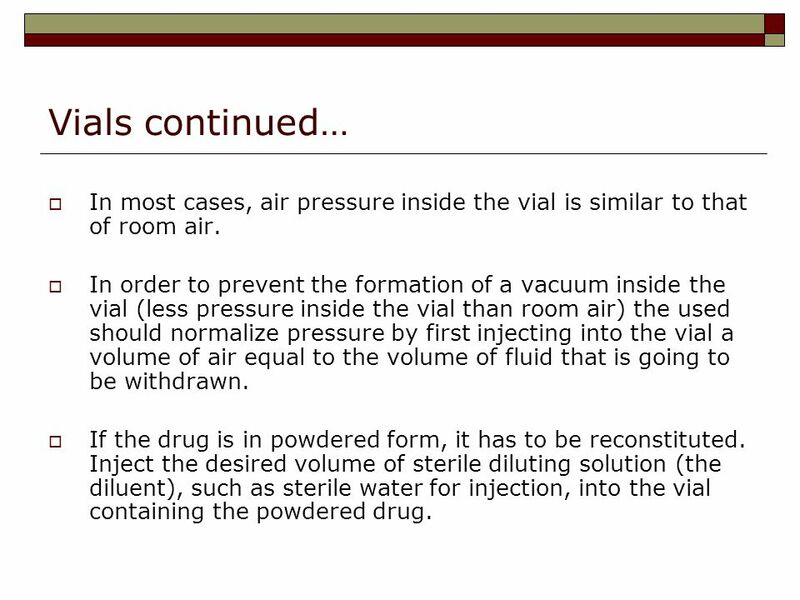 In order to prevent the formation of a vacuum inside the vial (less pressure inside the vial than room air) the used should normalize pressure by first injecting into the vial a volume of air equal to the volume of fluid that is going to be withdrawn. If the drug is in powdered form, it has to be reconstituted. Inject the desired volume of sterile diluting solution (the diluent), such as sterile water for injection, into the vial containing the powdered drug. 46 Vials continued… An equal volume of air must be removed in order to prevent a positive pressure from developing inside the vial. 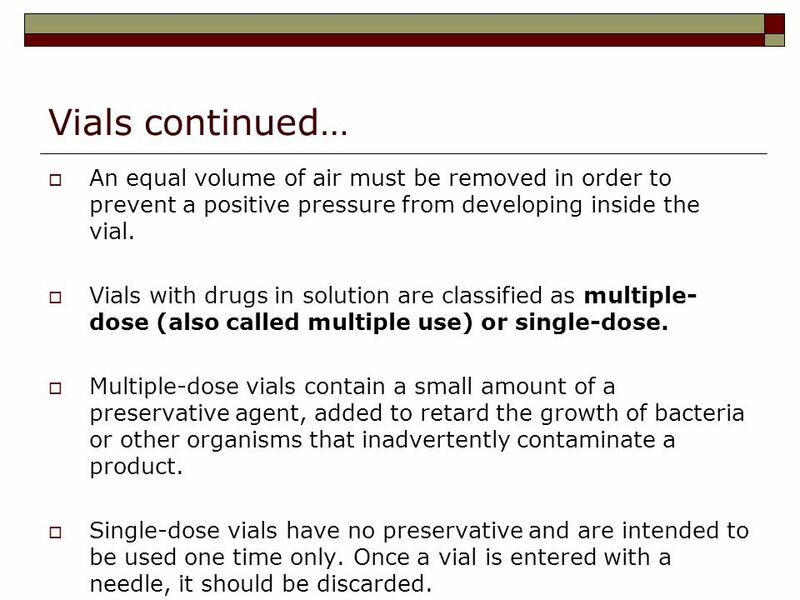 Vials with drugs in solution are classified as multiple-dose (also called multiple use) or single-dose. Multiple-dose vials contain a small amount of a preservative agent, added to retard the growth of bacteria or other organisms that inadvertently contaminate a product. 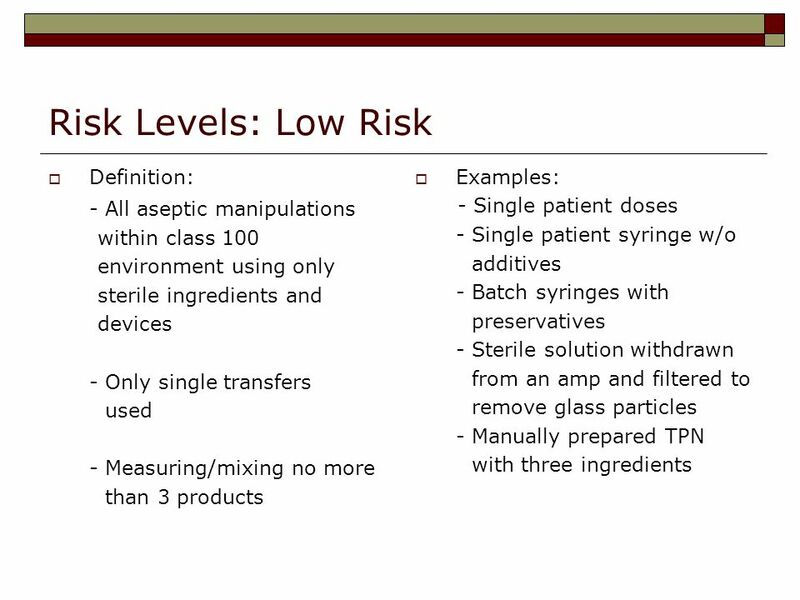 Single-dose vials have no preservative and are intended to be used one time only. Once a vial is entered with a needle, it should be discarded. 47 Pre-filled Syringes Drugs commonly given IM or IV are packaged this way to make them convenient for the health care provider. 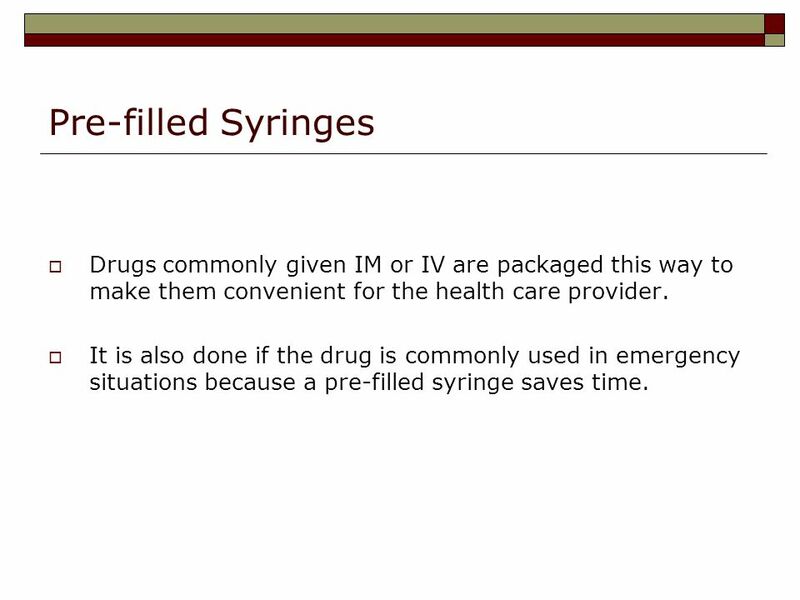 It is also done if the drug is commonly used in emergency situations because a pre-filled syringe saves time. 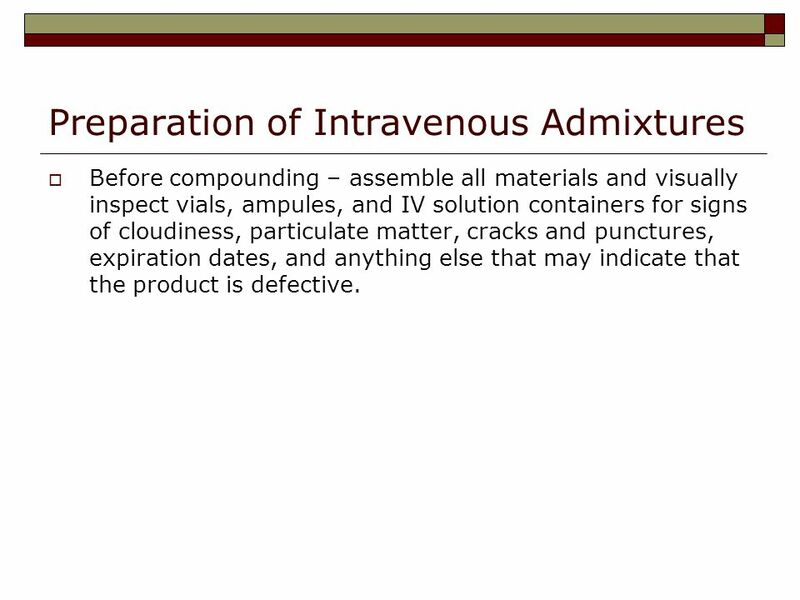 Before compounding – assemble all materials and visually inspect vials, ampules, and IV solution containers for signs of cloudiness, particulate matter, cracks and punctures, expiration dates, and anything else that may indicate that the product is defective. Next, disinfect all injection surfaces and allow them to dry. - Flexible plastic bag – made of polyvinyl chloride (PVC) are frequently used. - Easier to store, less breakable than glass bottles, and eliminates the need to vent the container when removing fluid. - The protective overwrap should not be removed from a PVC bag until it is ready to be used. 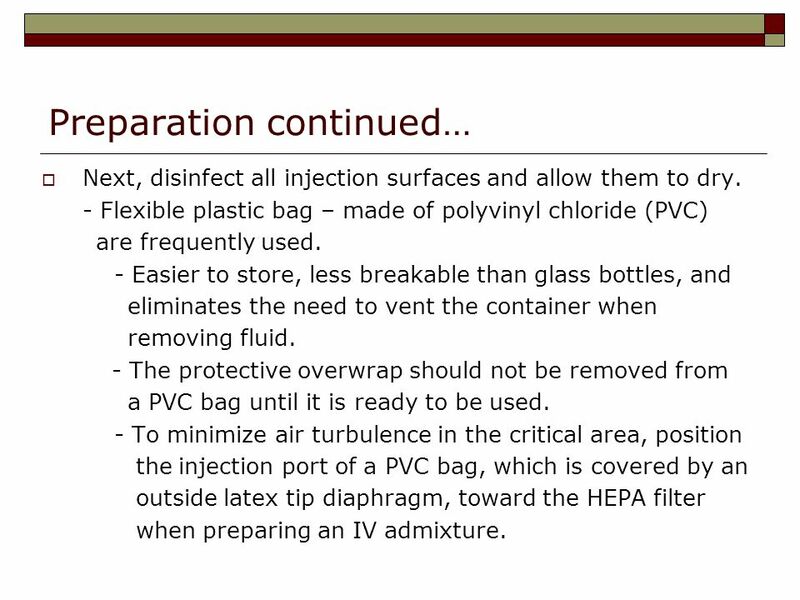 - To minimize air turbulence in the critical area, position the injection port of a PVC bag, which is covered by an outside latex tip diaphragm, toward the HEPA filter when preparing an IV admixture. 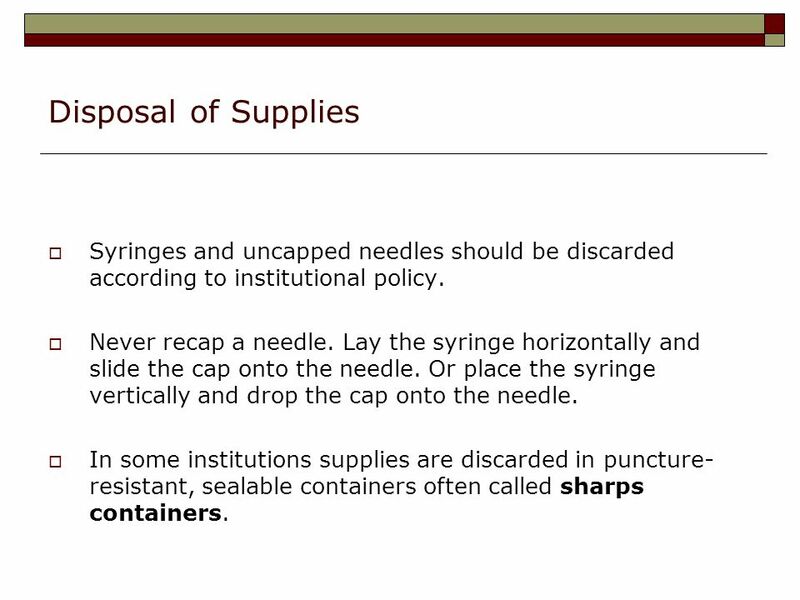 50 Disposal of Supplies Syringes and uncapped needles should be discarded according to institutional policy. Never recap a needle. Lay the syringe horizontally and slide the cap onto the needle. Or place the syringe vertically and drop the cap onto the needle. In some institutions supplies are discarded in puncture-resistant, sealable containers often called sharps containers. 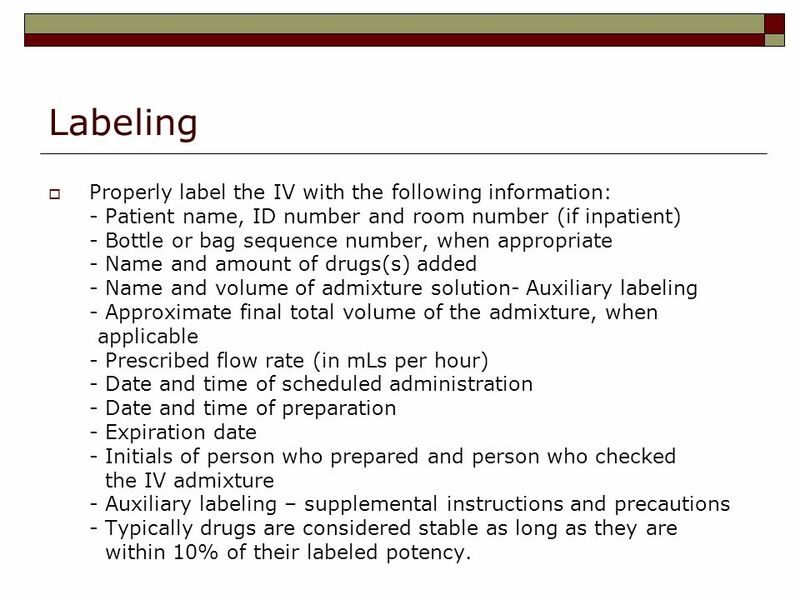 - Patient name, ID number and room number (if inpatient) - Bottle or bag sequence number, when appropriate - Name and amount of drugs(s) added - Name and volume of admixture solution- Auxiliary labeling - Approximate final total volume of the admixture, when applicable - Prescribed flow rate (in mLs per hour) - Date and time of scheduled administration - Date and time of preparation - Expiration date - Initials of person who prepared and person who checked the IV admixture - Auxiliary labeling – supplemental instructions and precautions - Typically drugs are considered stable as long as they are within 10% of their labeled potency. 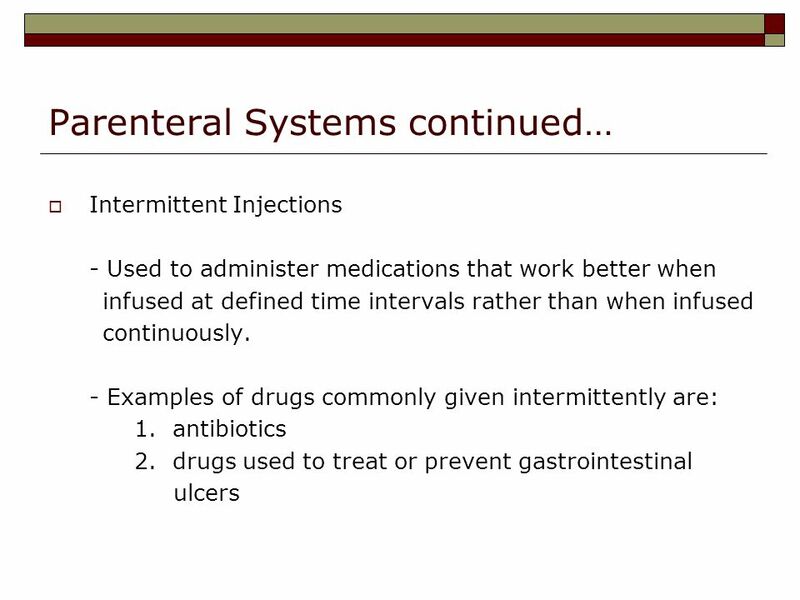 - Types of systems for intermittent injections: 1. Large Volume Parenterals (PVC) a. Usually defined as those IV solutions containing more than 100 mL b. Usually infused as solutions of dilute dextrose and/or sodium chloride as continuous infusions with or without additives, but they can be used for intermittent infusions as well. - Commercially Available 1. Preparations with additives are used in standard concentrations, are stable in solution for long periods of time. 2. Available in a variety of sizes and containers 3. Ready-to-use products are advantageous because they reduce handling by the pharmacy, - the potential for contamination. - Pharmacy Prepared 1. Made in the pharmacy to meet the specific needs of patients 2. 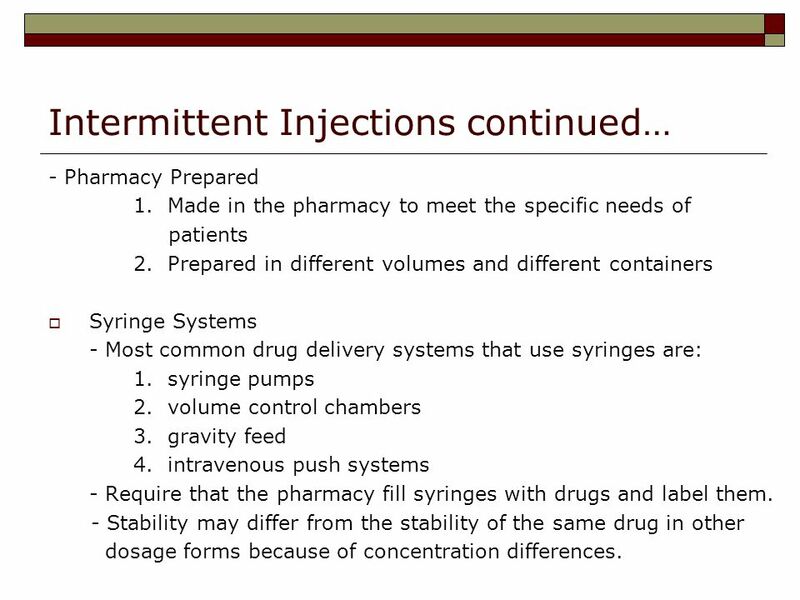 Prepared in different volumes and different containers Syringe Systems - Most common drug delivery systems that use syringes are: 1. syringe pumps 2. volume control chambers 3. gravity feed 4. intravenous push systems - Require that the pharmacy fill syringes with drugs and label them. - Stability may differ from the stability of the same drug in other dosage forms because of concentration differences. Syringe Pumps 1. Used to administer drugs by means of a specially designed syringe pump and tubing set. 2. Pumps are either operated by a battery or a compressing spring. 3. Pumps are also available to administer a single dose per setup or a 12 or 24 hour supply at preprogrammed intervals. Volume Control Chambers (Buretrol or Volutrol) 1. The drug is injected through a port on top of the chamber, and solution is added from the primary LVP. 2. With this system, minimal amounts of fluid can be given per dose, a method that may be beneficial in fluid-restricted or pediatric patients. Gravity Feed 1. 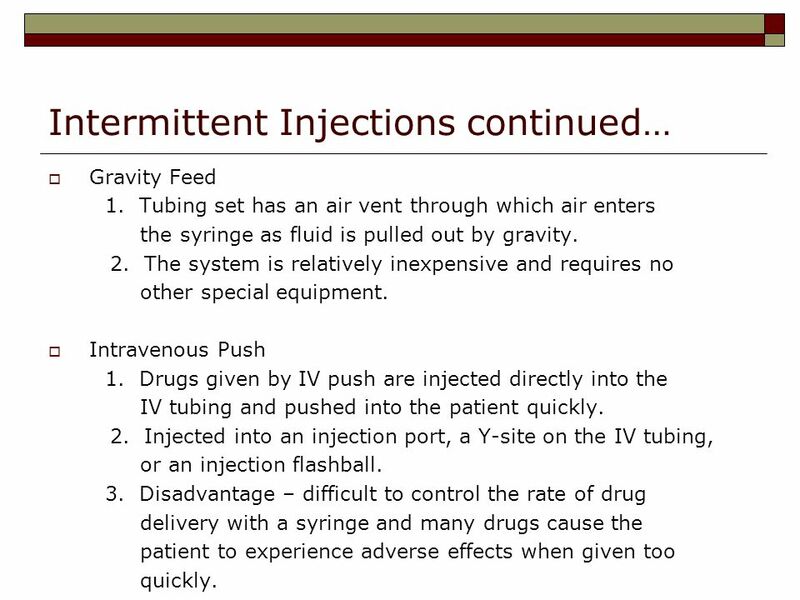 Tubing set has an air vent through which air enters the syringe as fluid is pulled out by gravity. 2. The system is relatively inexpensive and requires no other special equipment. Intravenous Push 1. Drugs given by IV push are injected directly into the IV tubing and pushed into the patient quickly. 2. Injected into an injection port, a Y-site on the IV tubing, or an injection flashball. 3. Disadvantage – difficult to control the rate of drug delivery with a syringe and many drugs cause the patient to experience adverse effects when given too quickly. Small Volume Parenterals (“Piggyback” Systems) 1. 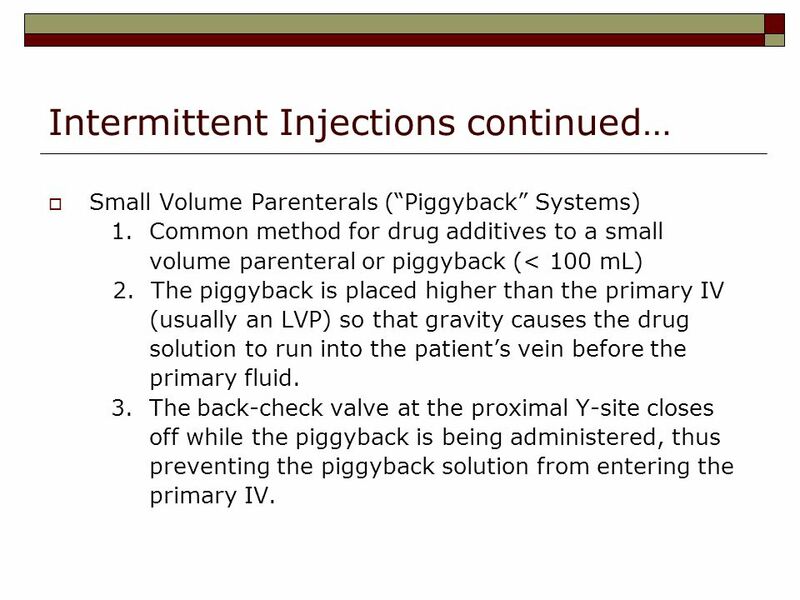 Common method for drug additives to a small volume parenteral or piggyback (< 100 mL) 2. The piggyback is placed higher than the primary IV (usually an LVP) so that gravity causes the drug solution to run into the patient’s vein before the primary fluid. 3. The back-check valve at the proximal Y-site closes off while the piggyback is being administered, thus preventing the piggyback solution from entering the primary IV. Add-Vantage – specially designed bag and a vial Vial Spike System – similar in concept to the Add-Vantage system – not activated until just before administration. Premixed Solutions – often frozen and thawed by the pharmacy hours or days before administration. 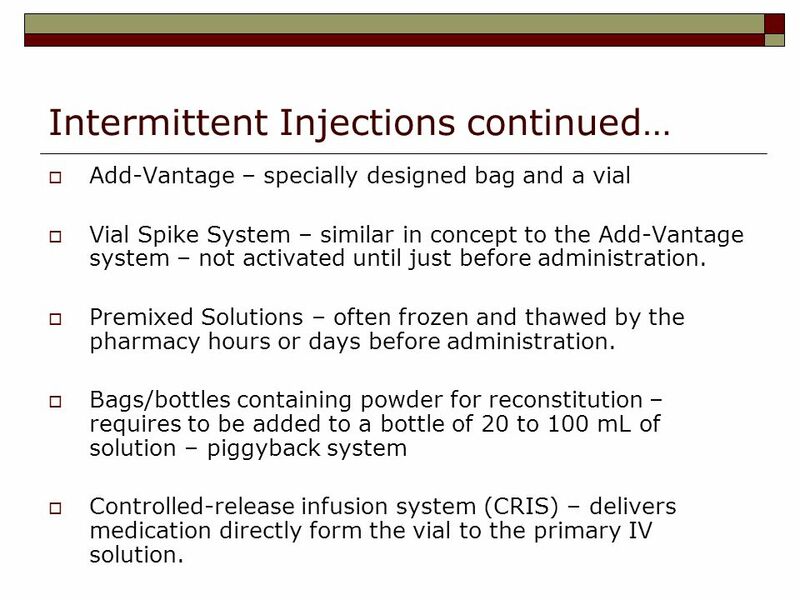 Bags/bottles containing powder for reconstitution – requires to be added to a bottle of 20 to 100 mL of solution – piggyback system Controlled-release infusion system (CRIS) – delivers medication directly form the vial to the primary IV solution. A method of drug administration usually used with injectable pain medications, which is very effective in managing pain. 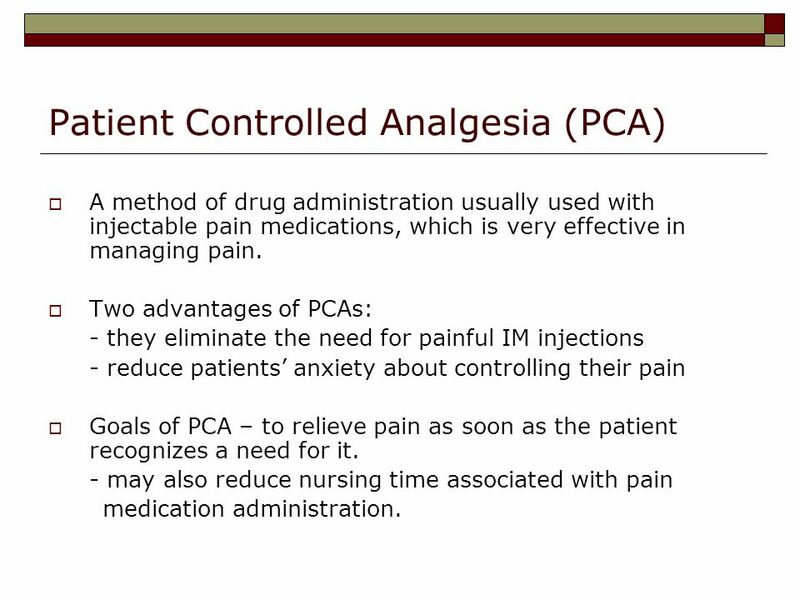 Two advantages of PCAs: - they eliminate the need for painful IM injections - reduce patients’ anxiety about controlling their pain Goals of PCA – to relieve pain as soon as the patient recognizes a need for it. - may also reduce nursing time associated with pain medication administration. 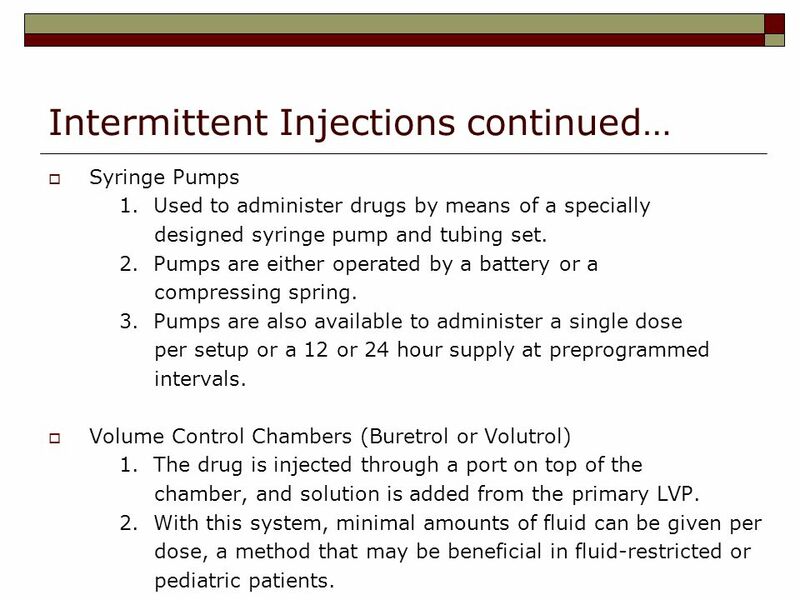 61 PCA continued… Used with either a stationary or a portable pump. 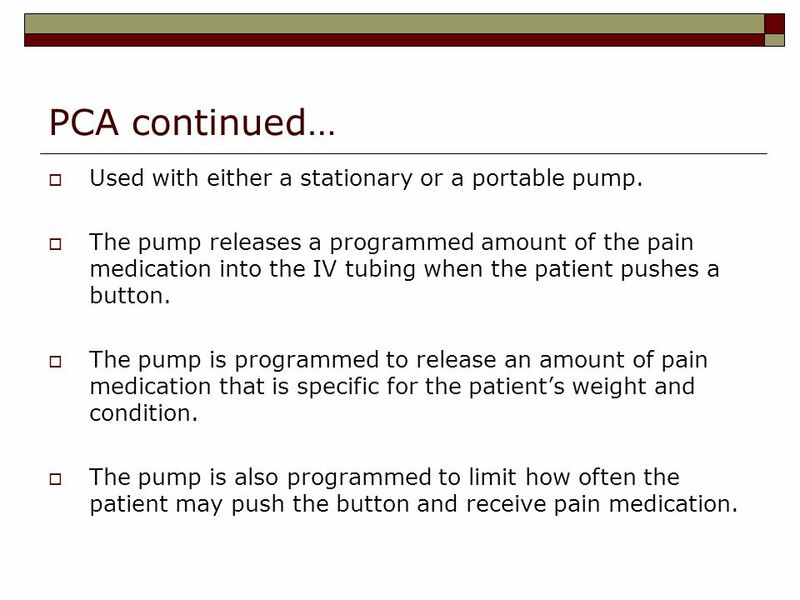 The pump releases a programmed amount of the pain medication into the IV tubing when the patient pushes a button. The pump is programmed to release an amount of pain medication that is specific for the patient’s weight and condition. The pump is also programmed to limit how often the patient may push the button and receive pain medication. 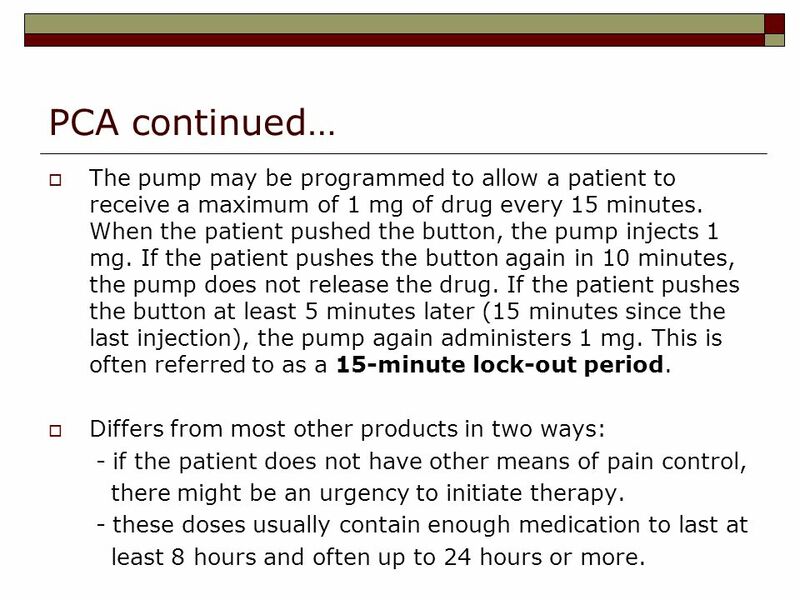 62 PCA continued… The pump may be programmed to allow a patient to receive a maximum of 1 mg of drug every 15 minutes. When the patient pushed the button, the pump injects 1 mg. If the patient pushes the button again in 10 minutes, the pump does not release the drug. If the patient pushes the button at least 5 minutes later (15 minutes since the last injection), the pump again administers 1 mg. This is often referred to as a 15-minute lock-out period. Differs from most other products in two ways: - if the patient does not have other means of pain control, there might be an urgency to initiate therapy. - these doses usually contain enough medication to last at least 8 hours and often up to 24 hours or more. Definition: - Total parenteral nutrition (also known as hyperalimentation, hyperal or TPN) is the IV administration of nutrients needed to sustain life: carbohydrates, protein, fats, water, electrolytes, vitamins, and trace elements. - Usually initiated in patients who cannot meet their nutritional needs from other sources for an extended period of time. 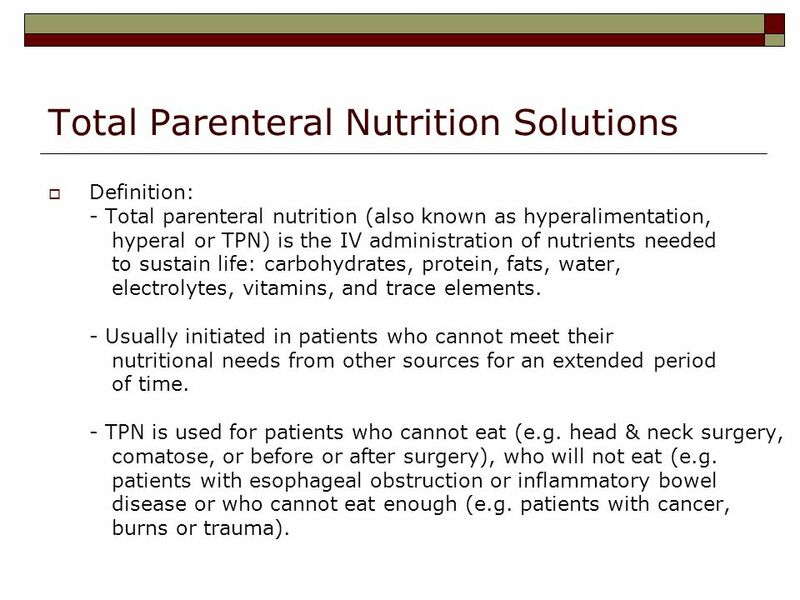 - TPN is used for patients who cannot eat (e.g. head & neck surgery, comatose, or before or after surgery), who will not eat (e.g. patients with esophageal obstruction or inflammatory bowel disease or who cannot eat enough (e.g. patients with cancer, burns or trauma). Contain base components and additives - Base components are usually mixed first and make up much of the volume of the TPN. Composed of dextrose (carbohydrates) and amino acids (protein) and may include fat and water. - Additives are usually mixed with the base components and include life-sustaining nutrients, electrolytes, vitamins, trace elements as well as heparin, insulin and H2 antagonists. 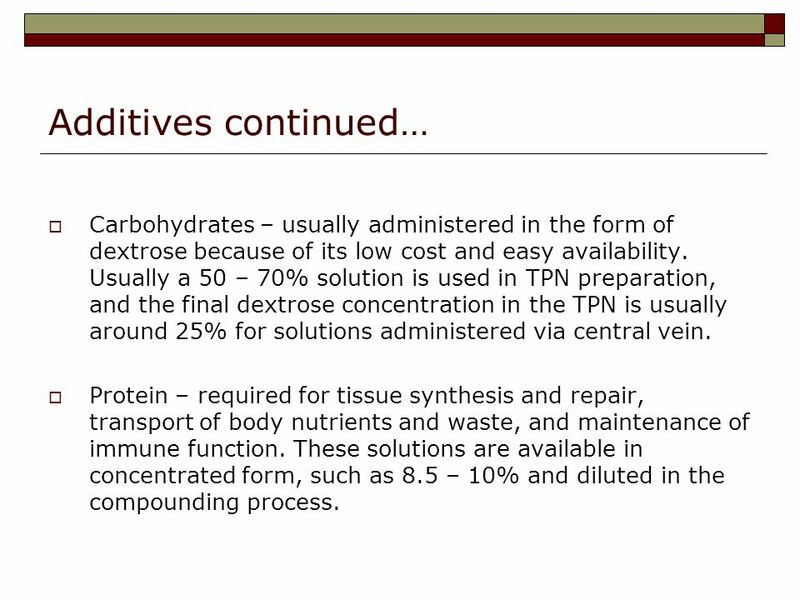 65 Additives continued… Carbohydrates – usually administered in the form of dextrose because of its low cost and easy availability. Usually a 50 – 70% solution is used in TPN preparation, and the final dextrose concentration in the TPN is usually around 25% for solutions administered via central vein. Protein – required for tissue synthesis and repair, transport of body nutrients and waste, and maintenance of immune function. These solutions are available in concentrated form, such as 8.5 – 10% and diluted in the compounding process. 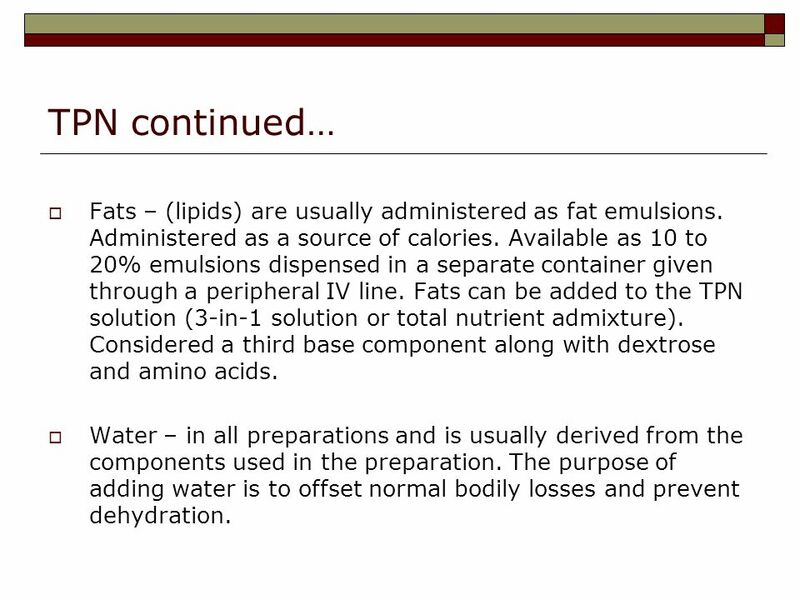 66 TPN continued… Fats – (lipids) are usually administered as fat emulsions. Administered as a source of calories. Available as 10 to 20% emulsions dispensed in a separate container given through a peripheral IV line. 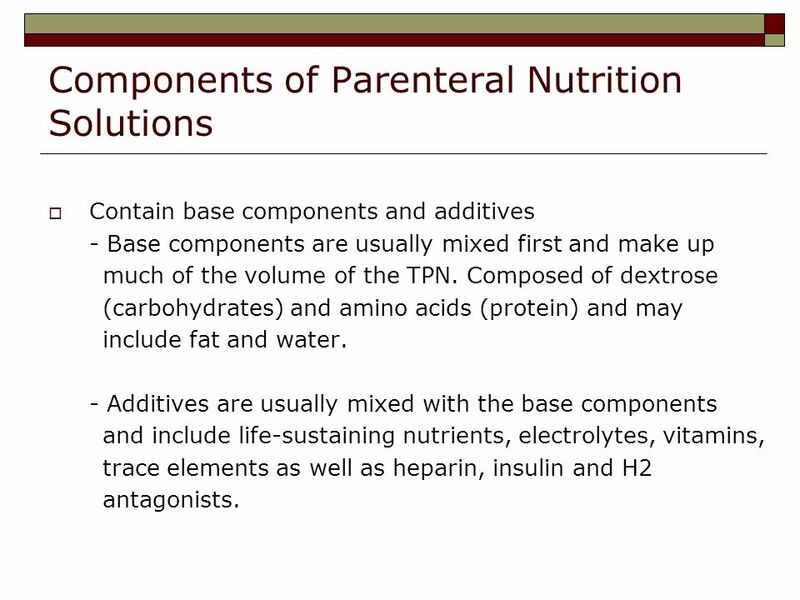 Fats can be added to the TPN solution (3-in-1 solution or total nutrient admixture). Considered a third base component along with dextrose and amino acids. Water – in all preparations and is usually derived from the components used in the preparation. The purpose of adding water is to offset normal bodily losses and prevent dehydration. 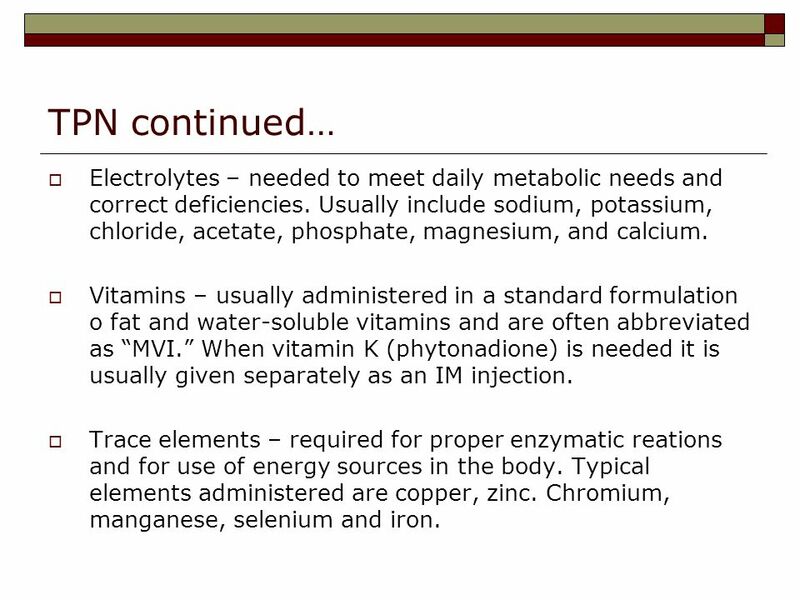 67 TPN continued… Electrolytes – needed to meet daily metabolic needs and correct deficiencies. Usually include sodium, potassium, chloride, acetate, phosphate, magnesium, and calcium. Vitamins – usually administered in a standard formulation o fat and water-soluble vitamins and are often abbreviated as “MVI.” When vitamin K (phytonadione) is needed it is usually given separately as an IM injection. Trace elements – required for proper enzymatic reations and for use of energy sources in the body. Typical elements administered are copper, zinc. Chromium, manganese, selenium and iron. 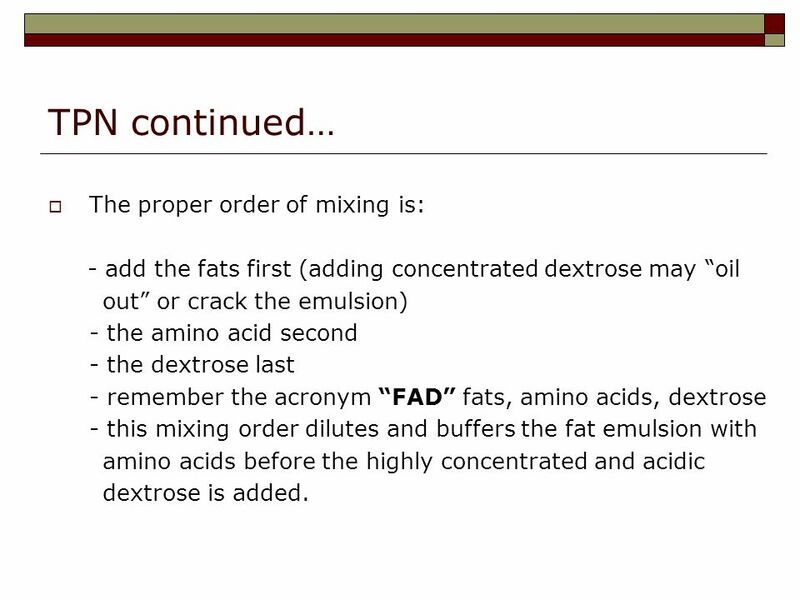 - add the fats first (adding concentrated dextrose may “oil out” or crack the emulsion) - the amino acid second - the dextrose last - remember the acronym “FAD” fats, amino acids, dextrose - this mixing order dilutes and buffers the fat emulsion with amino acids before the highly concentrated and acidic dextrose is added. Three primary pieces of equipment are used, sometimes together and sometimes individually. 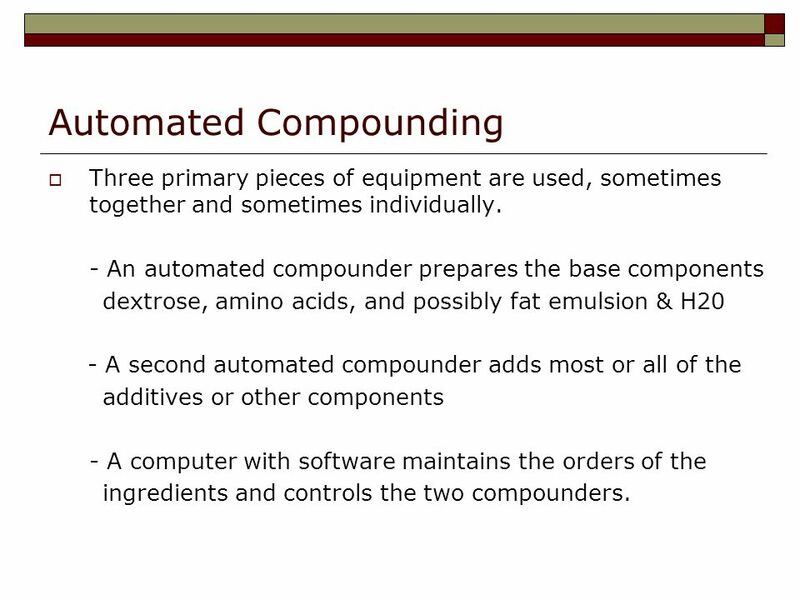 - An automated compounder prepares the base components dextrose, amino acids, and possibly fat emulsion & H20 - A second automated compounder adds most or all of the additives or other components - A computer with software maintains the orders of the ingredients and controls the two compounders. The base compounder accounts for the specific gravity of the solutions being used and actually weighs the amount pumped into the final container. The additives compounder weights the solution to ensure proper volumes and flushes the line between injections to avoid incompatibility problems. 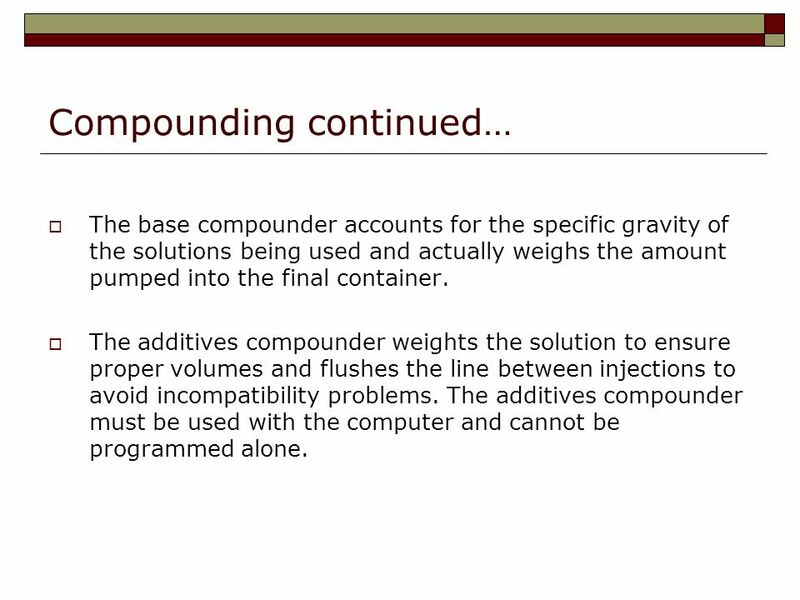 The additives compounder must be used with the computer and cannot be programmed alone. 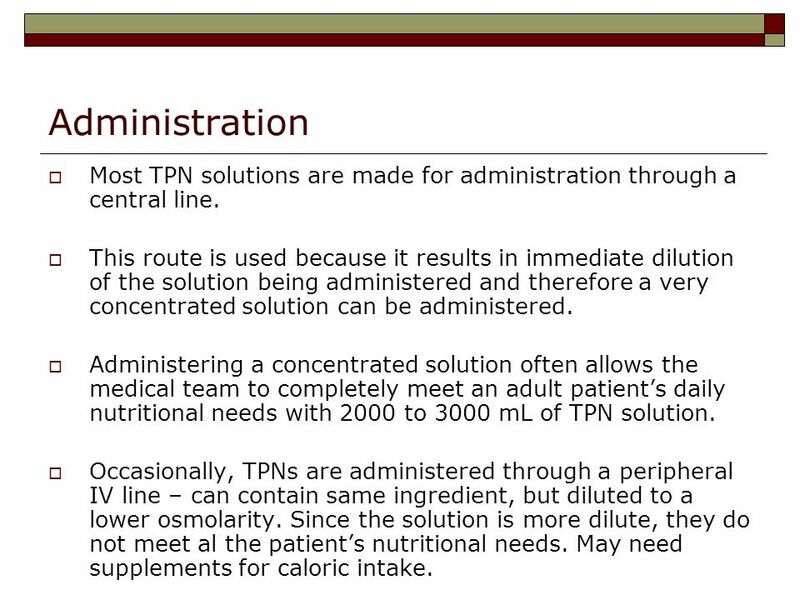 71 Administration Most TPN solutions are made for administration through a central line. This route is used because it results in immediate dilution of the solution being administered and therefore a very concentrated solution can be administered. Administering a concentrated solution often allows the medical team to completely meet an adult patient’s daily nutritional needs with 2000 to 3000 mL of TPN solution. Occasionally, TPNs are administered through a peripheral IV line – can contain same ingredient, but diluted to a lower osmolarity. Since the solution is more dilute, they do not meet al the patient’s nutritional needs. May need supplements for caloric intake. 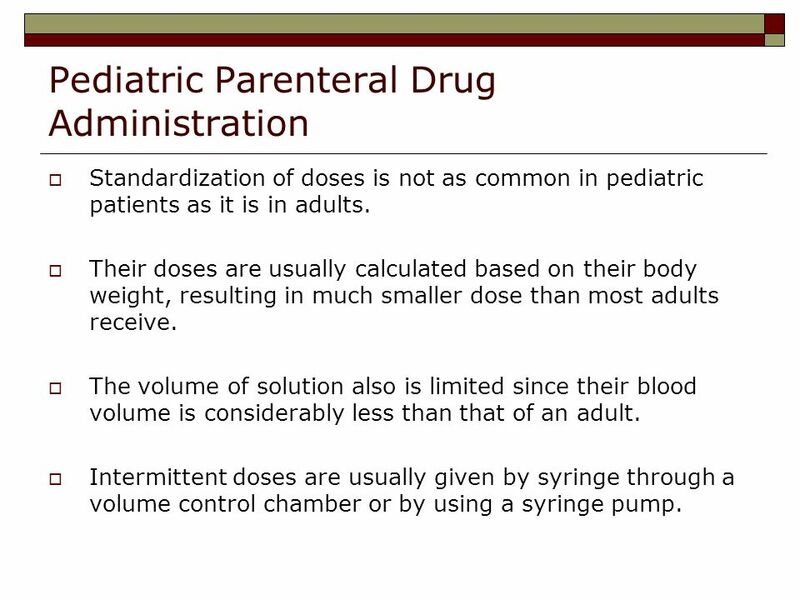 Standardization of doses is not as common in pediatric patients as it is in adults. Their doses are usually calculated based on their body weight, resulting in much smaller dose than most adults receive. The volume of solution also is limited since their blood volume is considerably less than that of an adult. 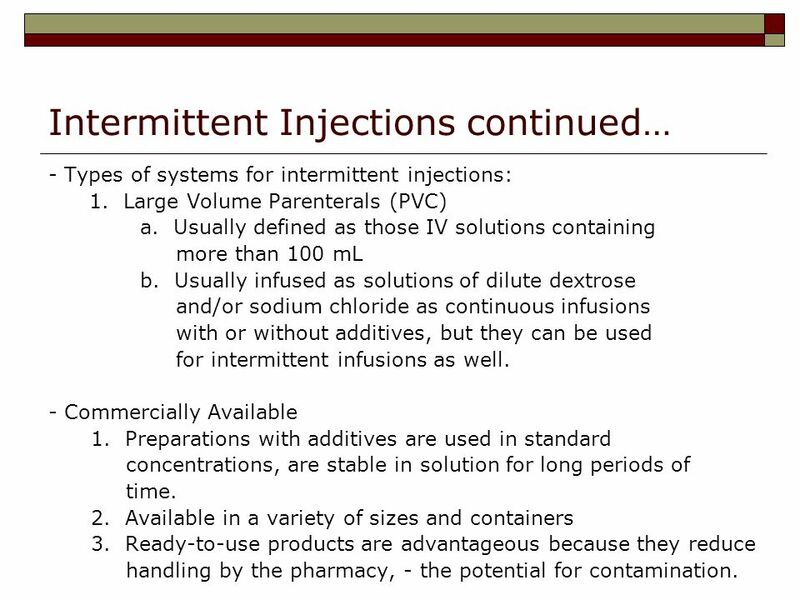 Intermittent doses are usually given by syringe through a volume control chamber or by using a syringe pump. 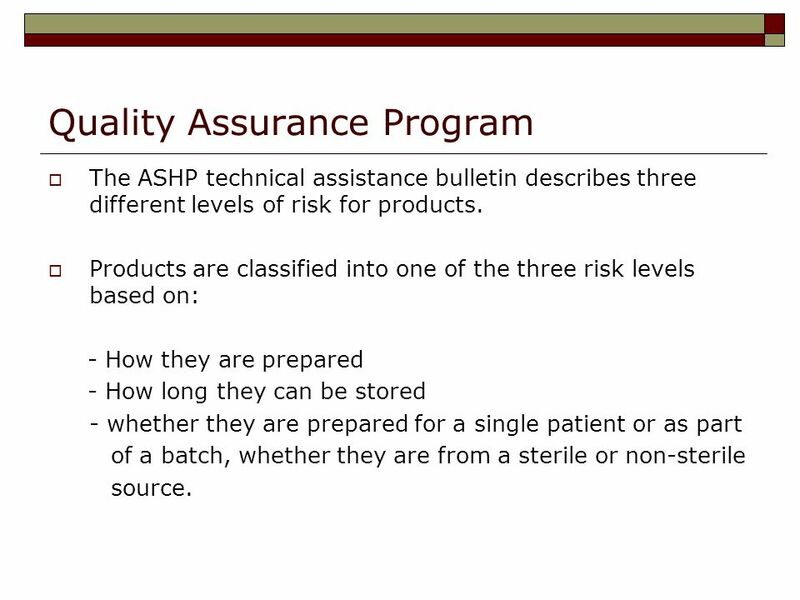 The ASHP technical assistance bulletin describes three different levels of risk for products. 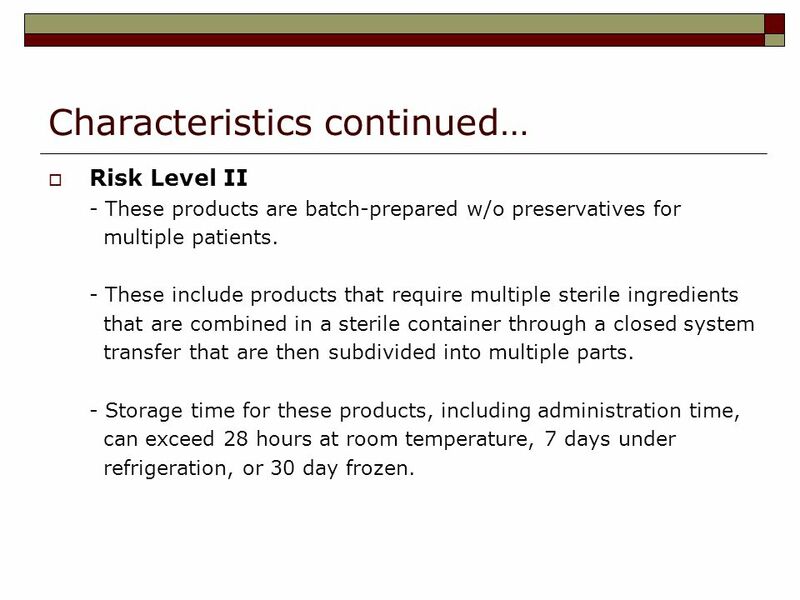 Products are classified into one of the three risk levels based on: - How they are prepared - How long they can be stored - whether they are prepared for a single patient or as part of a batch, whether they are from a sterile or non-sterile source. - Sterile products w/o preservatives for individual patients or batch prepared with preservatives for multiple patients. 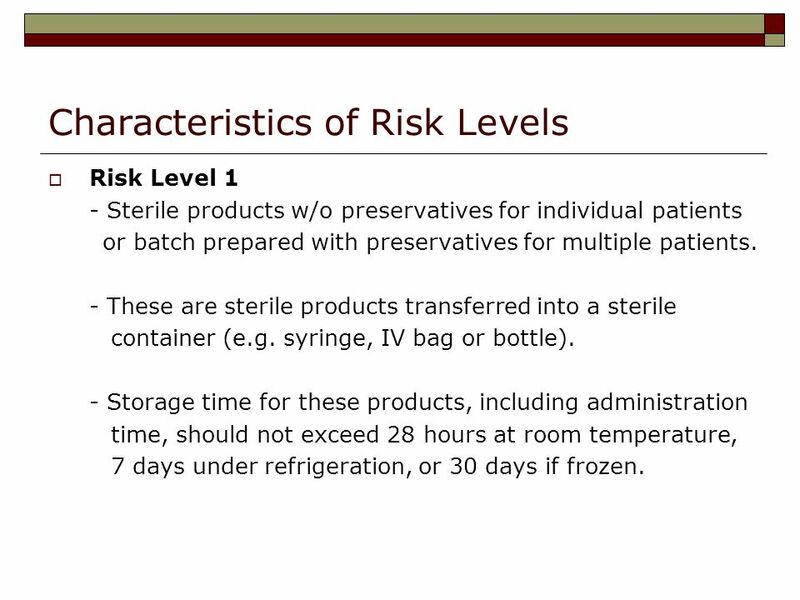 - These are sterile products transferred into a sterile container (e.g. syringe, IV bag or bottle). - Storage time for these products, including administration time, should not exceed 28 hours at room temperature, 7 days under refrigeration, or 30 days if frozen. 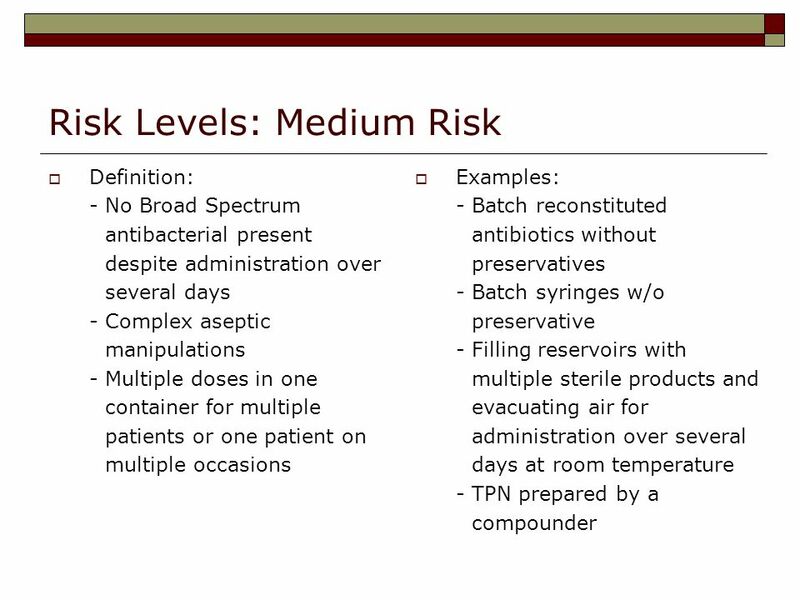 Risk Level II - These products are batch-prepared w/o preservatives for multiple patients. - These include products that require multiple sterile ingredients that are combined in a sterile container through a closed system transfer that are then subdivided into multiple parts. - Storage time for these products, including administration time, can exceed 28 hours at room temperature, 7 days under refrigeration, or 30 day frozen. 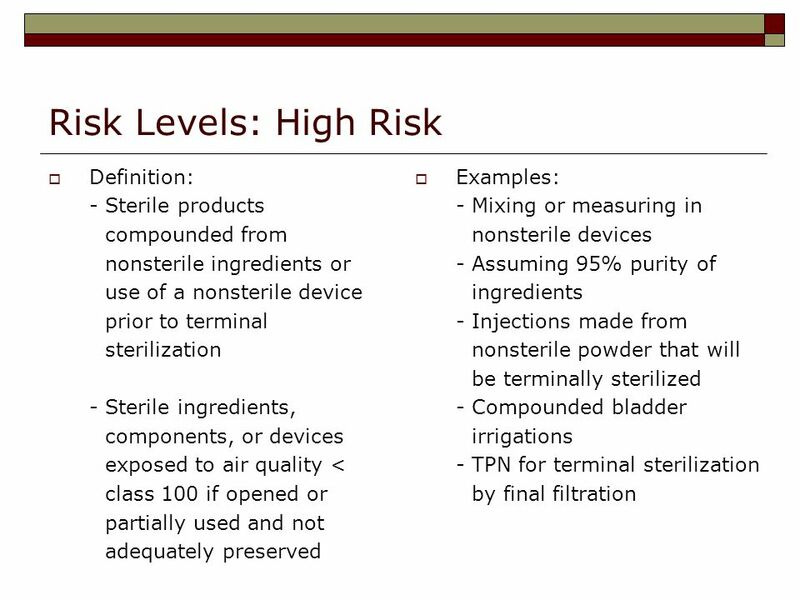 Risk Level III - These products are compounded from nonsterile ingredients, containers or equipment or prepared from sterile or nonsterile ingredients in an open system. 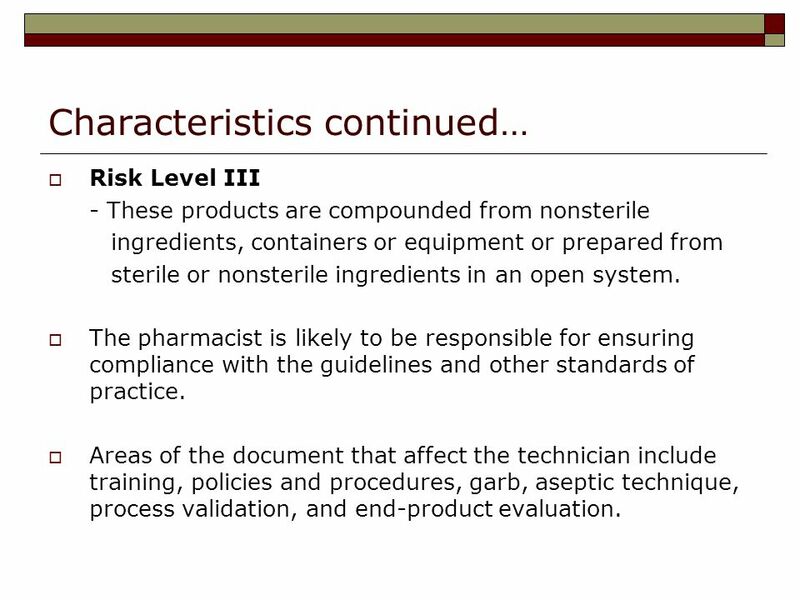 The pharmacist is likely to be responsible for ensuring compliance with the guidelines and other standards of practice. Areas of the document that affect the technician include training, policies and procedures, garb, aseptic technique, process validation, and end-product evaluation. 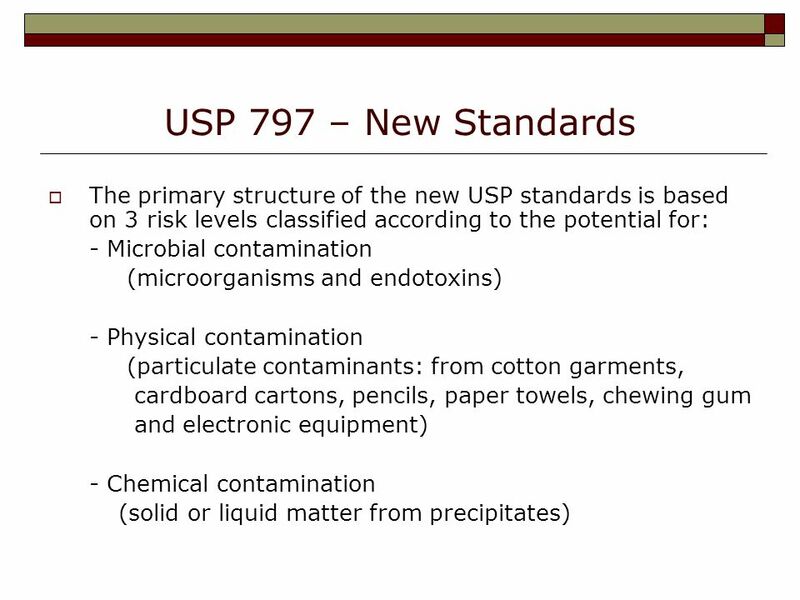 77 Process Validation Means procedures that ensure that the processes used in sterile product preparation consistently result in sterile products of acceptable quality. For most aseptic processes, validation is actually a method for evaluating the aseptic technique of personnel. 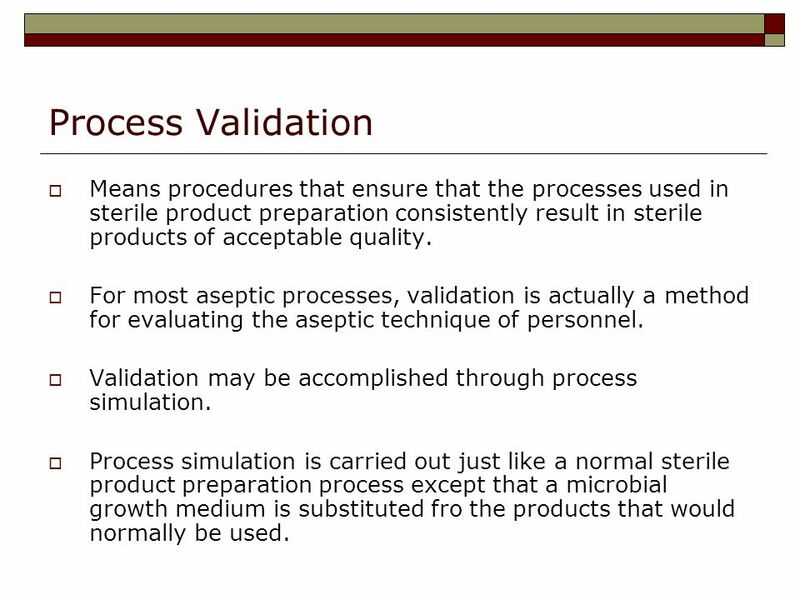 Validation may be accomplished through process simulation. Process simulation is carried out just like a normal sterile product preparation process except that a microbial growth medium is substituted fro the products that would normally be used. Once the sterile product is prepared, the growth medium is incubated and evaluated for microbial growth over a period of time. No microbial growth indicates that the person performing the preparation did not contaminated the product. 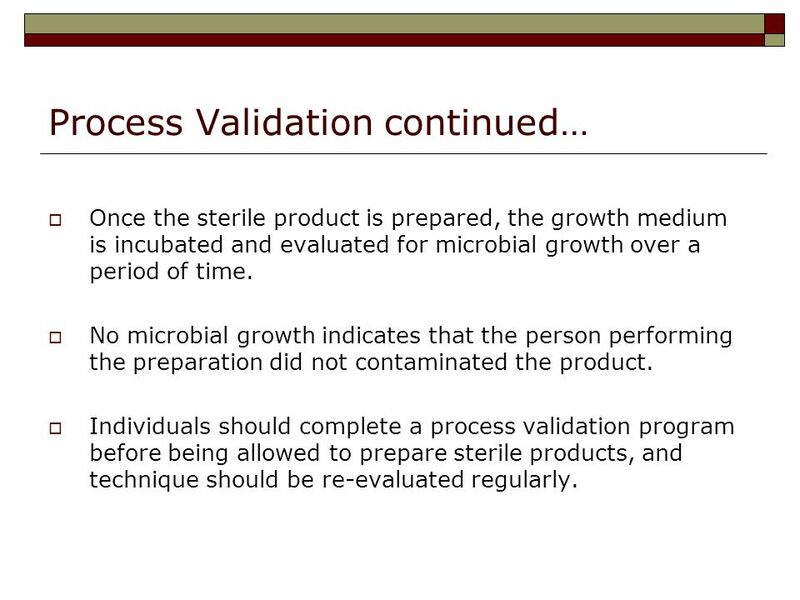 Individuals should complete a process validation program before being allowed to prepare sterile products, and technique should be re-evaluated regularly. 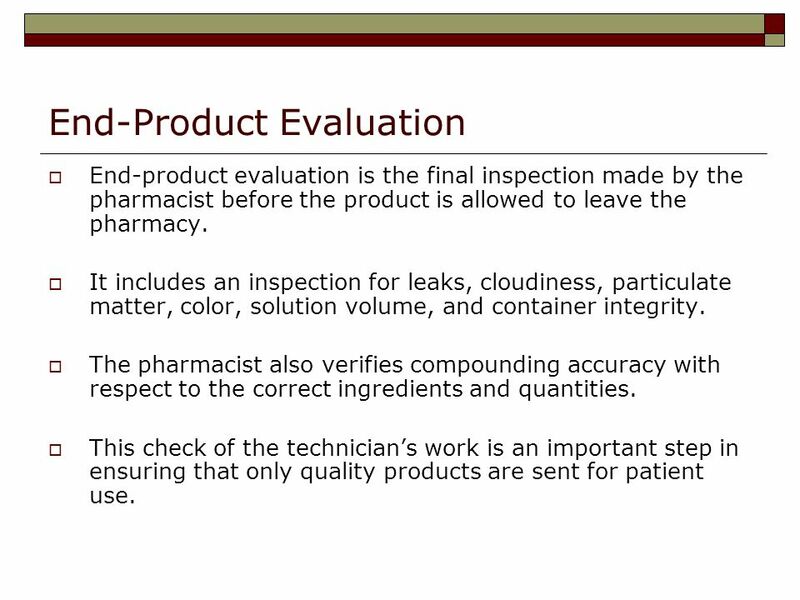 End-product evaluation is the final inspection made by the pharmacist before the product is allowed to leave the pharmacy. It includes an inspection for leaks, cloudiness, particulate matter, color, solution volume, and container integrity. The pharmacist also verifies compounding accuracy with respect to the correct ingredients and quantities. This check of the technician’s work is an important step in ensuring that only quality products are sent for patient use. 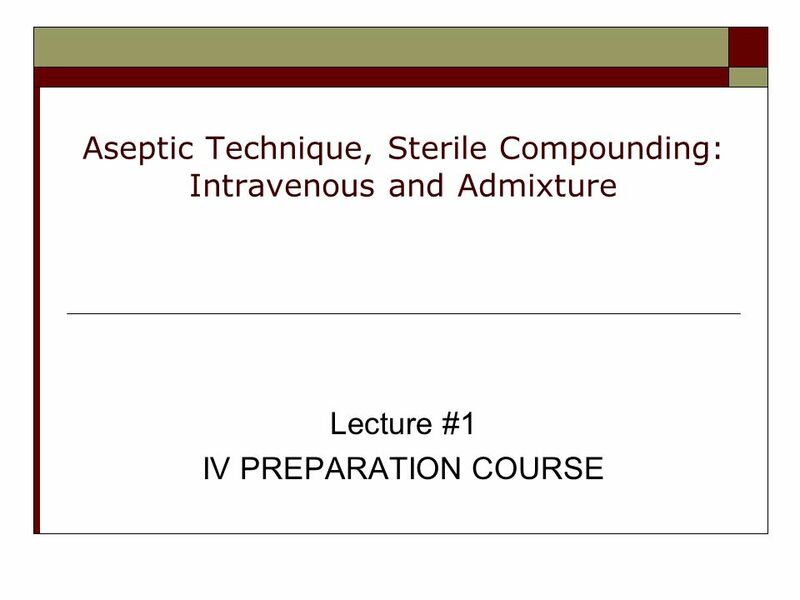 Download ppt "Aseptic Technique, Sterile Compounding: Intravenous and Admixture"
Chapter 10 Infection Control and Safe Handling of Hazardous Agents. Prepared By: Miss. Sana’a AL-Sulami. 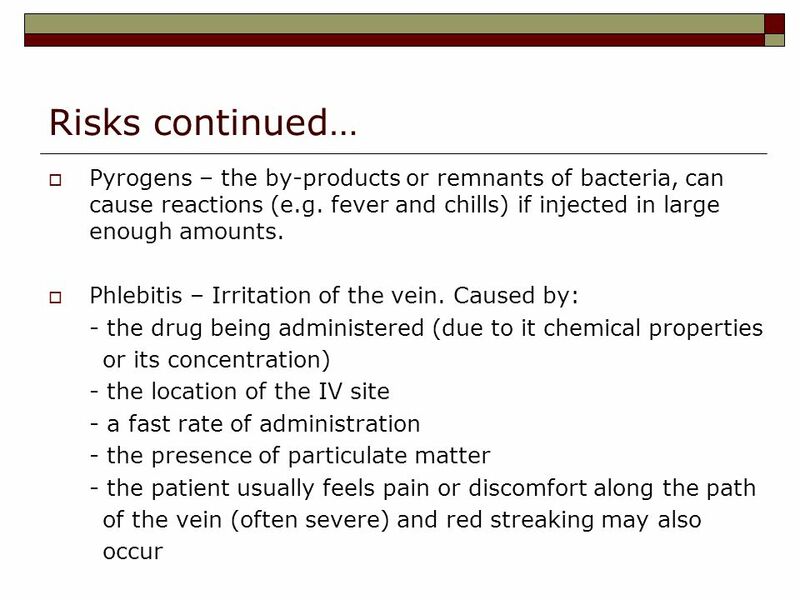 Outlines: What is the blood transfusion. Purpose of blood transfusion. Assessment of the patient. Planning for blood. 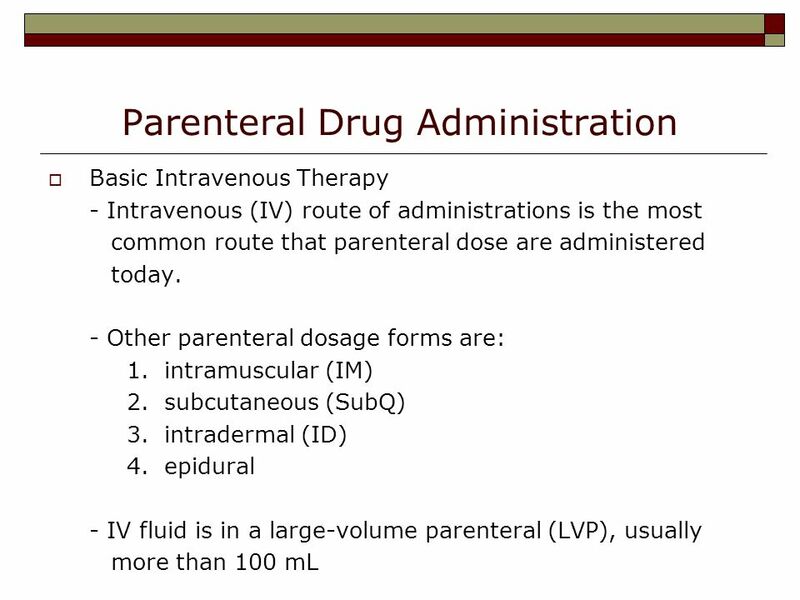 Parenteral Therapy Intravenous Therapy (IV) involves injecting a medication directly into the blood via venous access devices IV products must be sterile. SUR 111 LAB I. Resources  Textbook pages 148, ,  Study guide skill assessments:12-1 and 7-1 through 7-5. NUR 141: SKILL 22-6 ADMINISTERING INTRAVENOUS MEDICATION BY PIGGYBACK INTERMITTENT INFUSION SETS AND MINI-INFUSION PUMPS. Parenteral Medication Administration Devices Parenteral administration –Topical and transdermal medications –Inhalers –Sublingual medications –Injections.